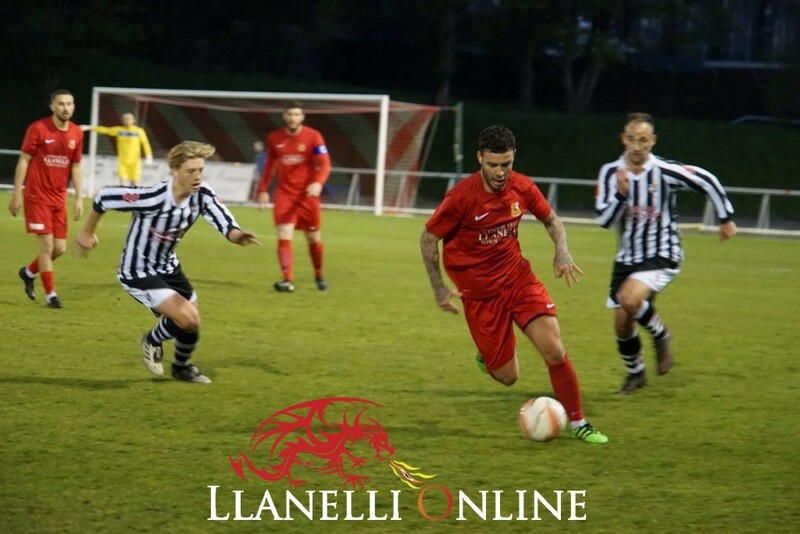 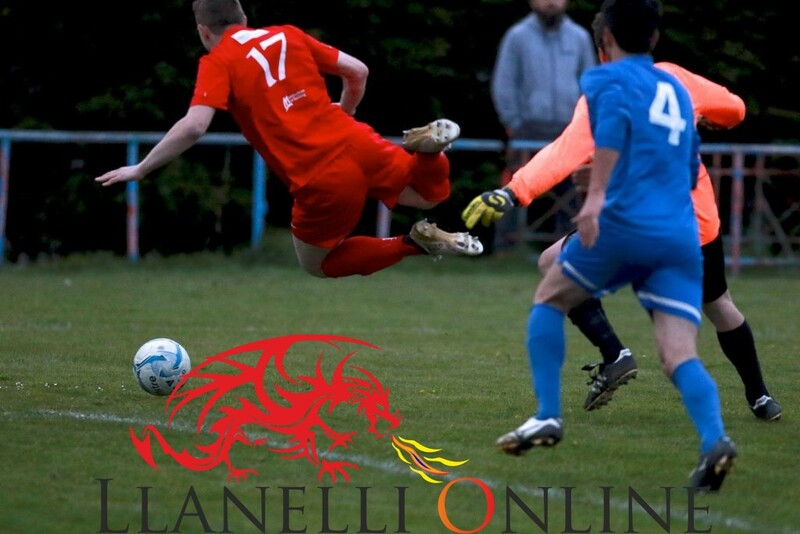 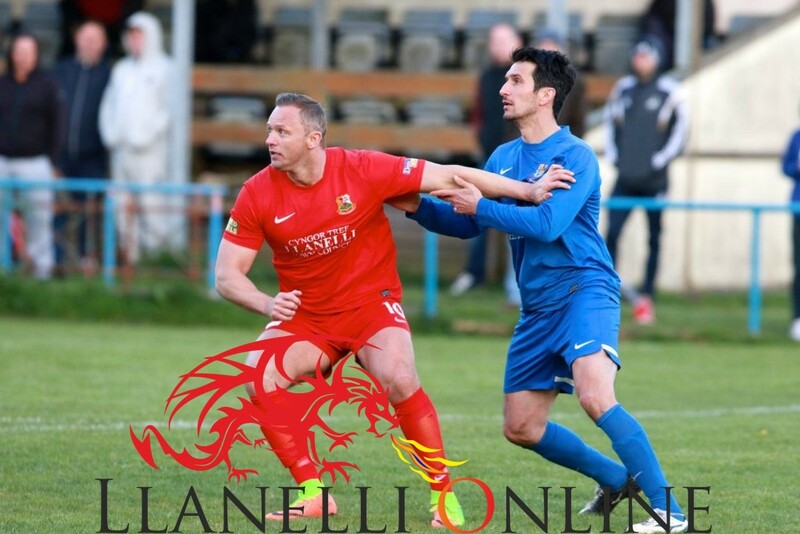 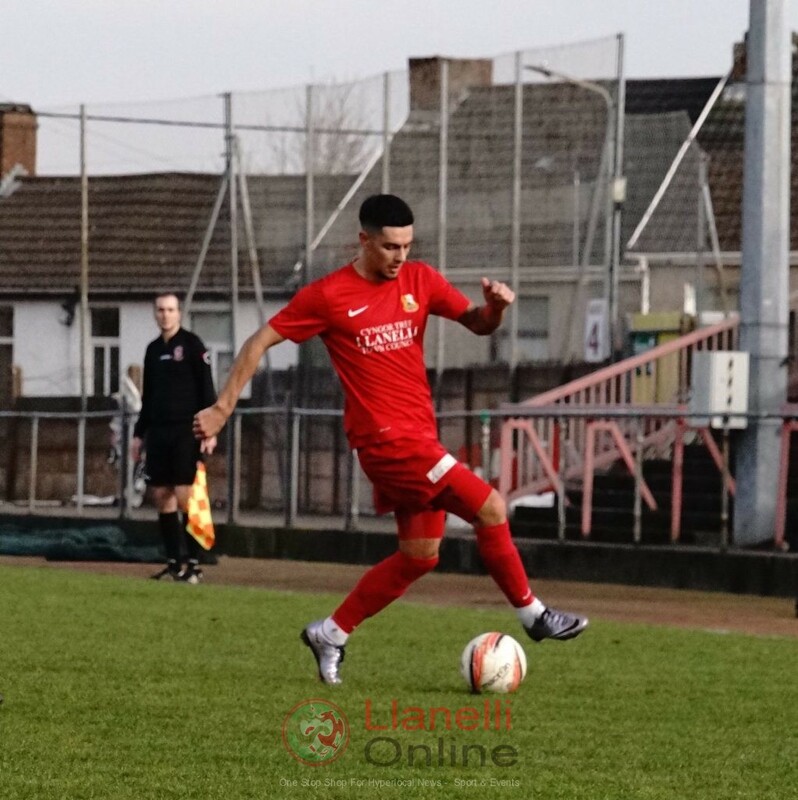 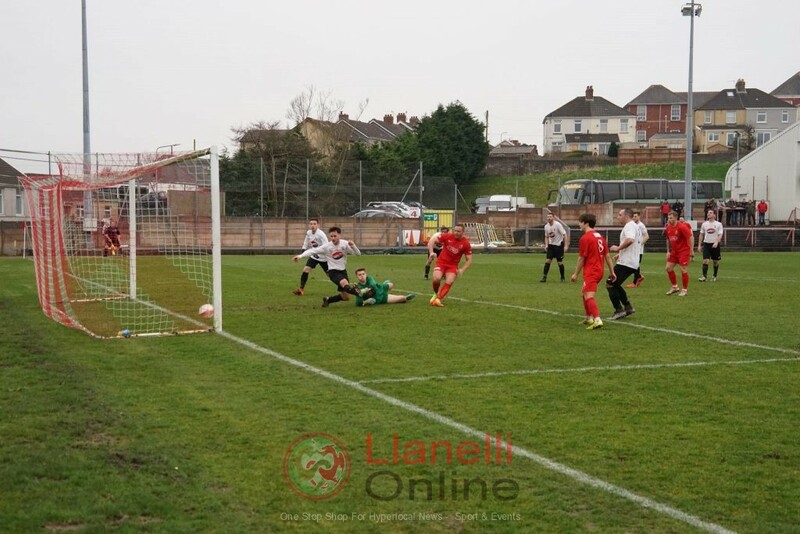 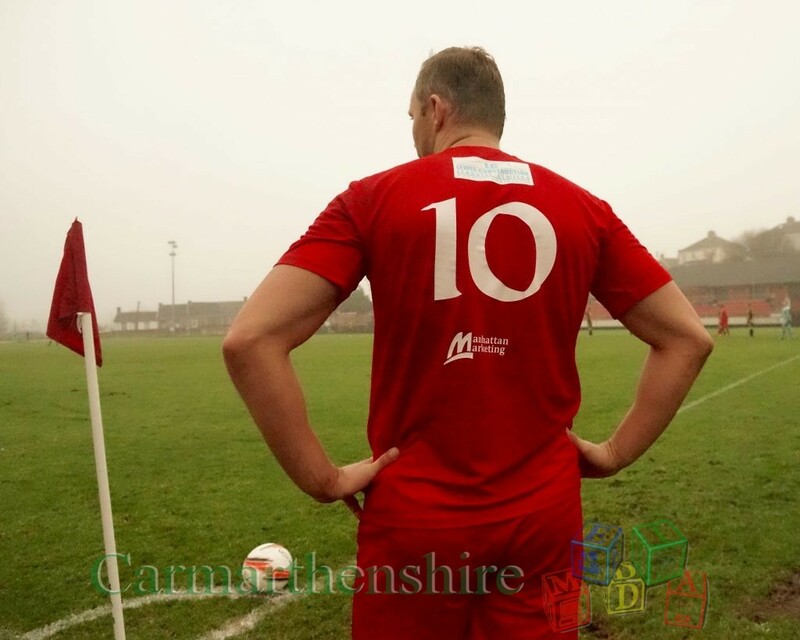 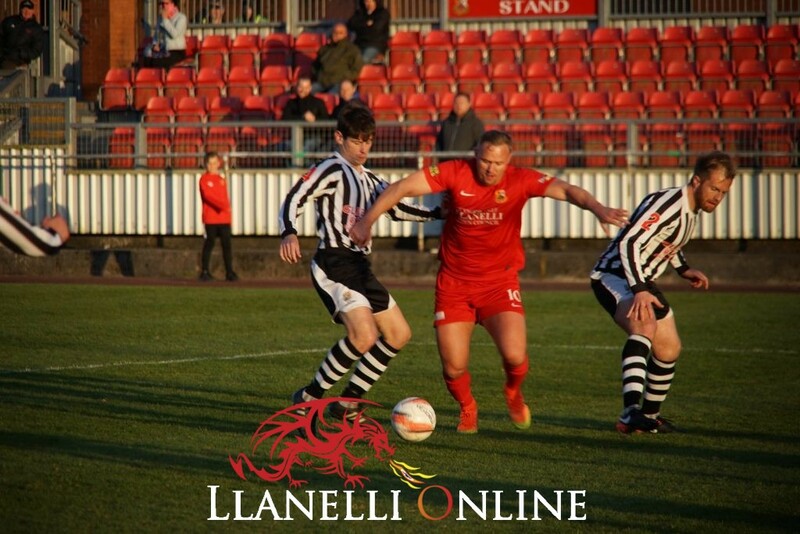 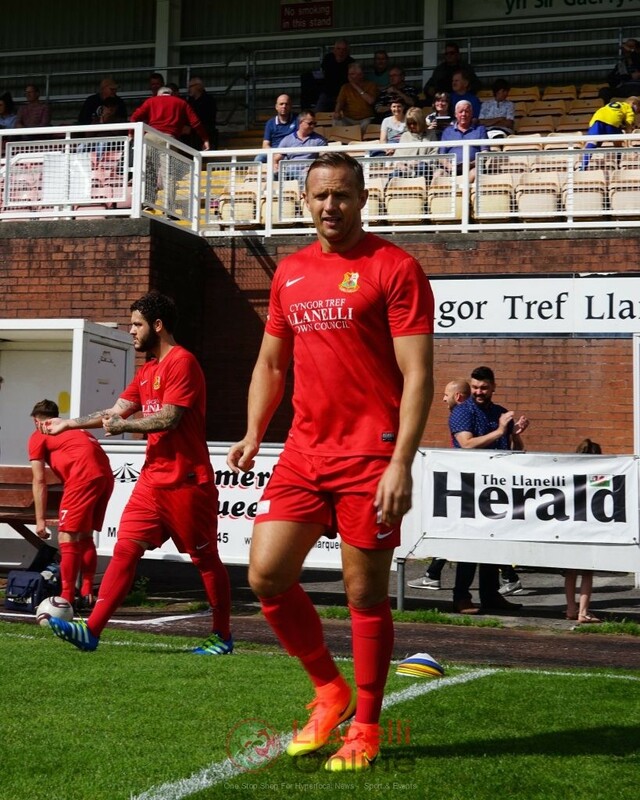 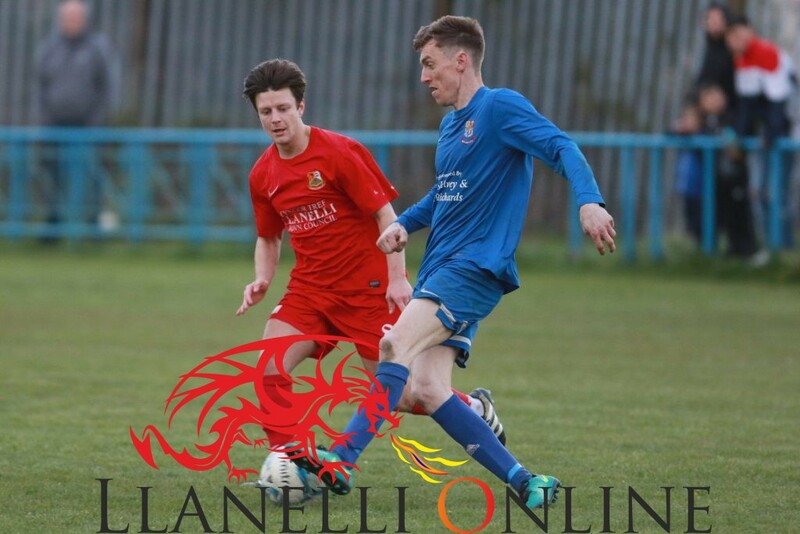 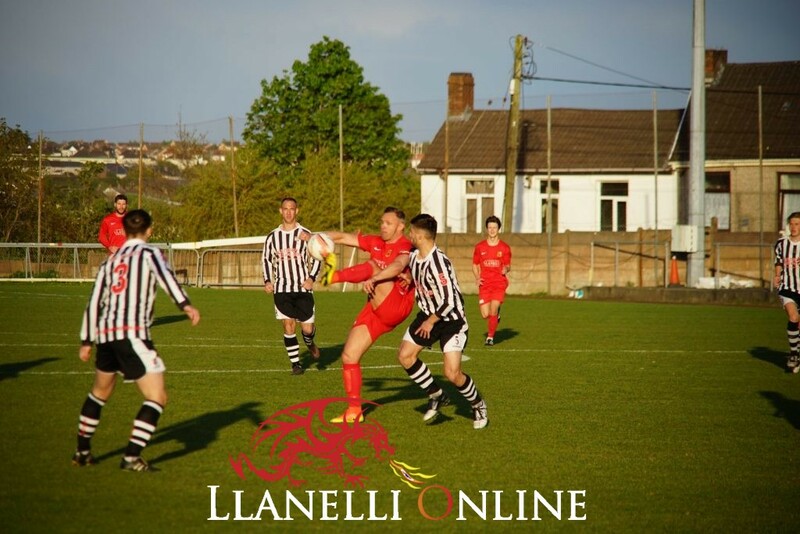 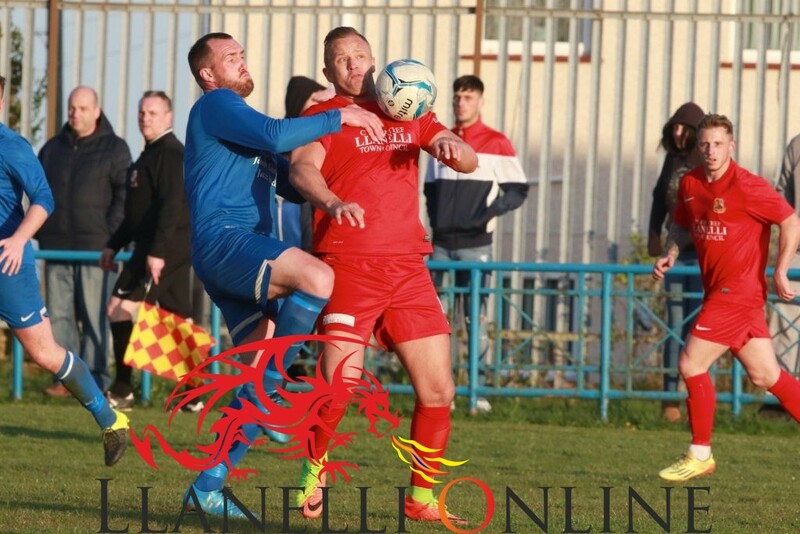 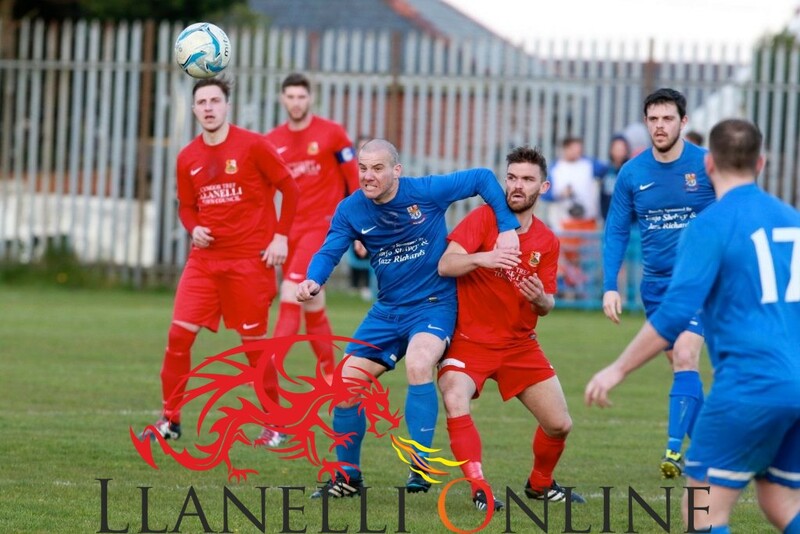 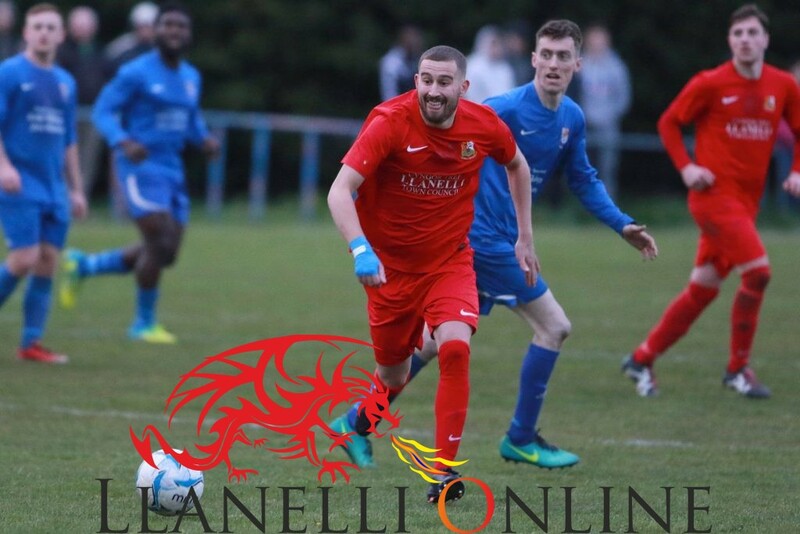 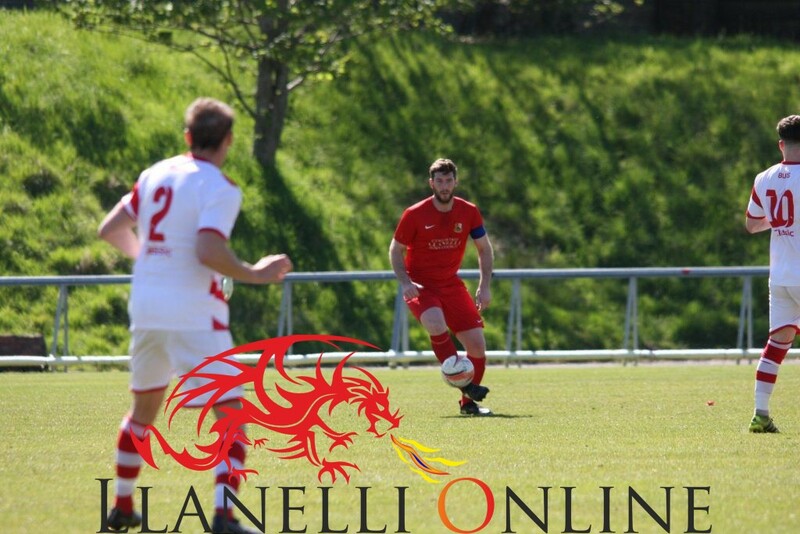 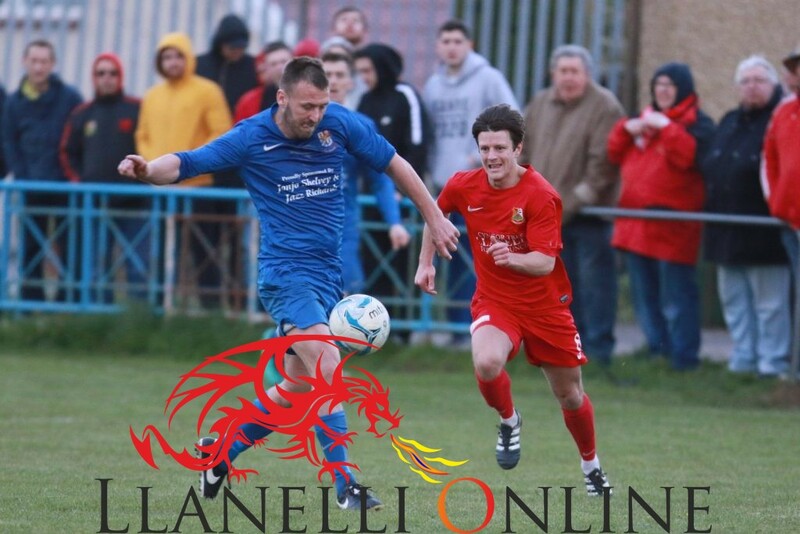 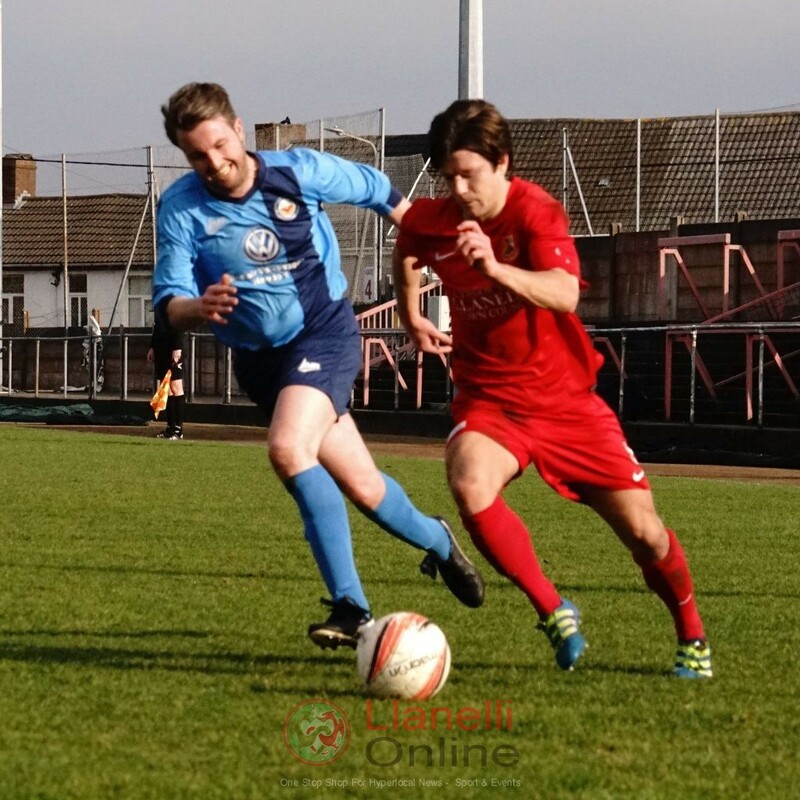 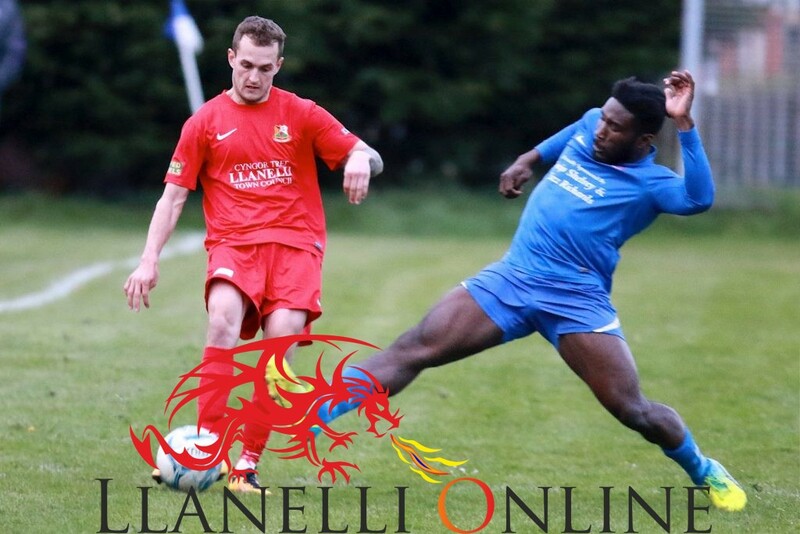 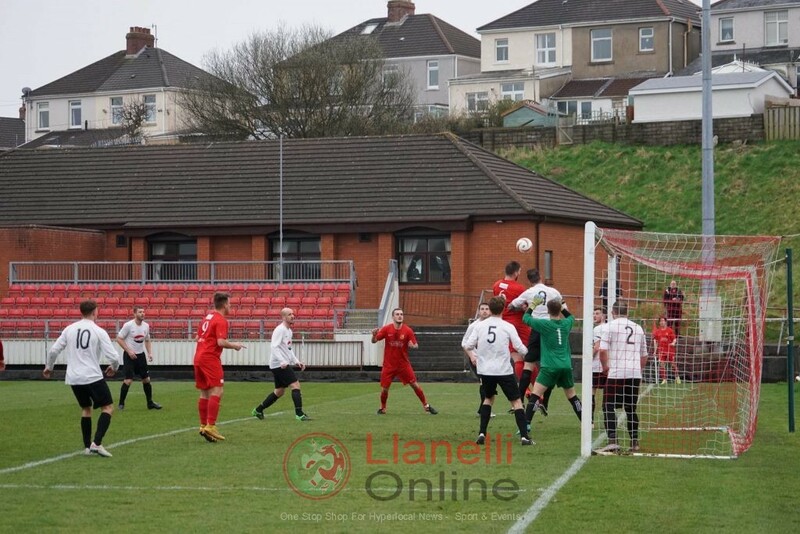 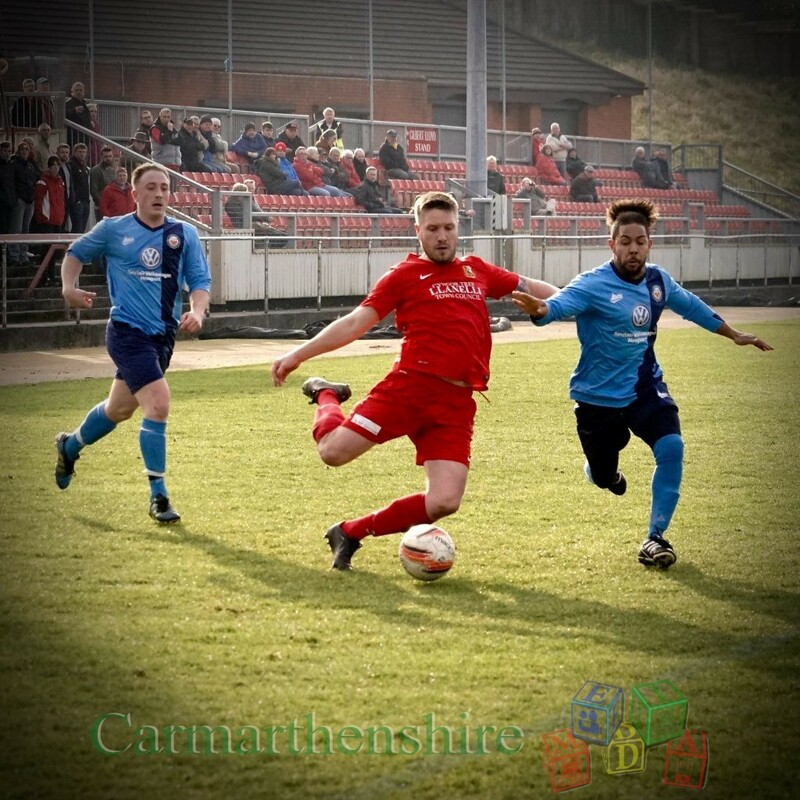 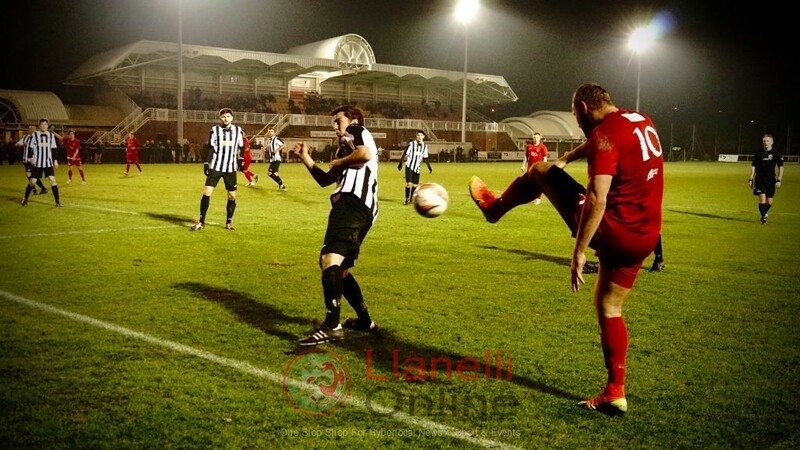 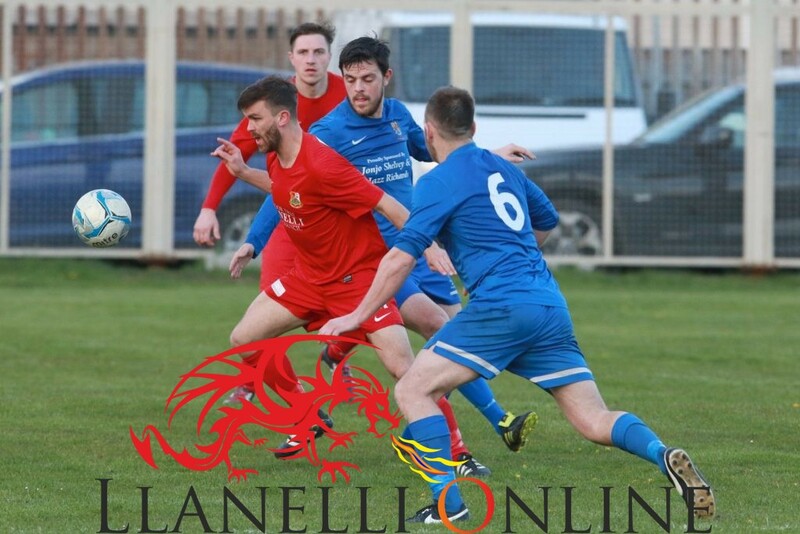 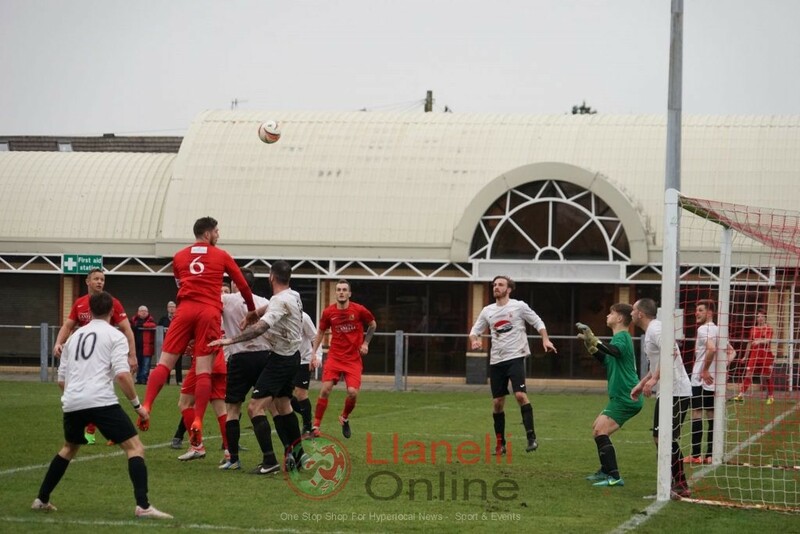 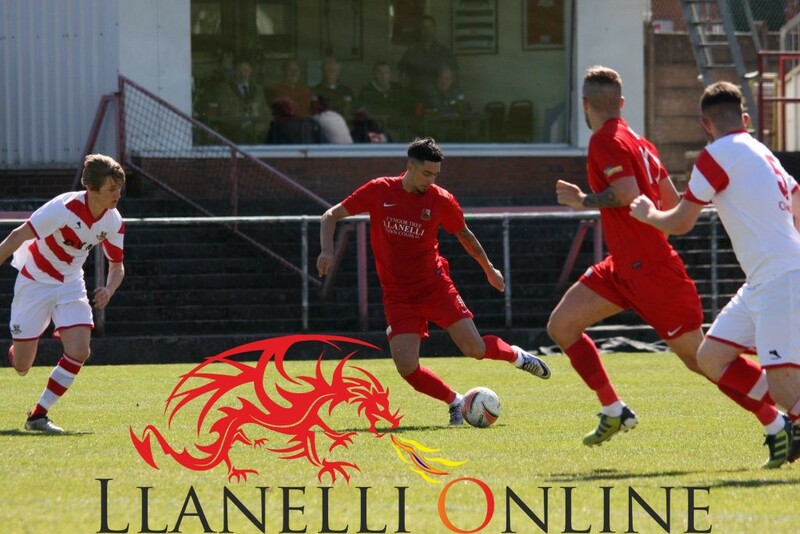 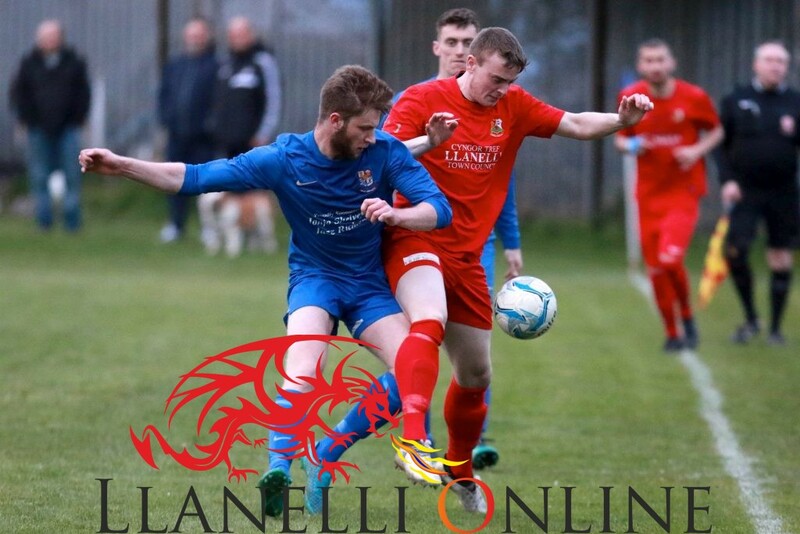 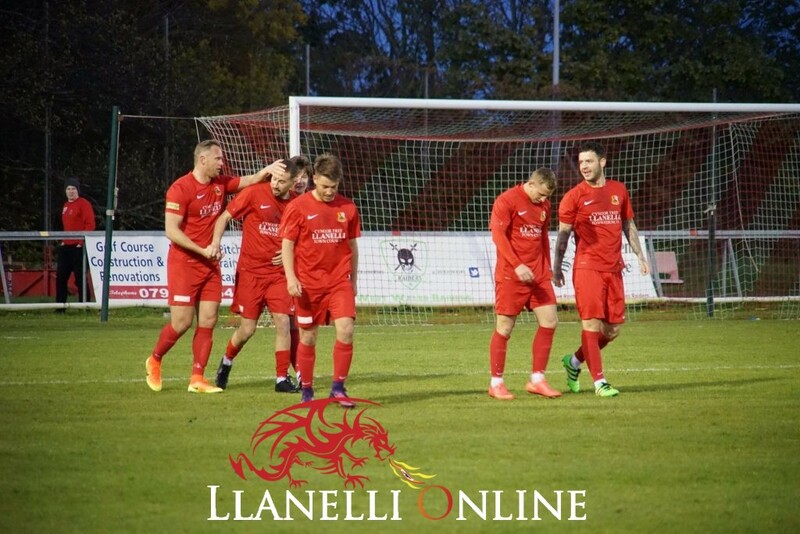 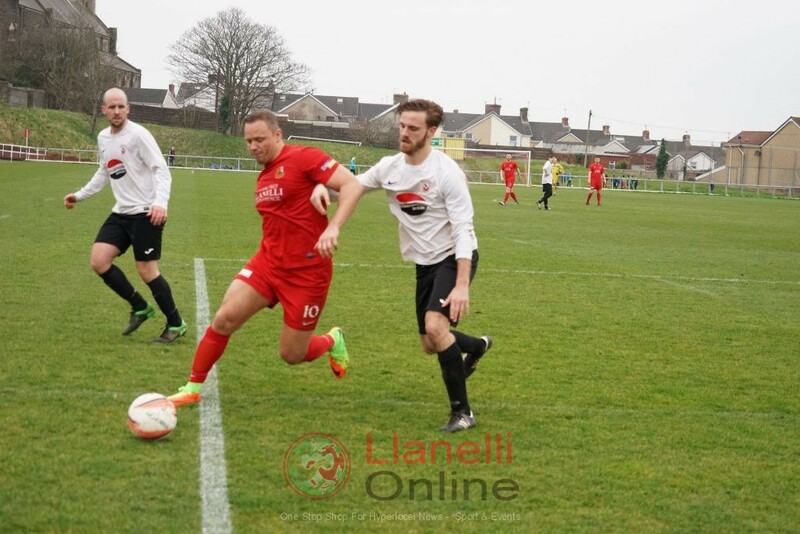 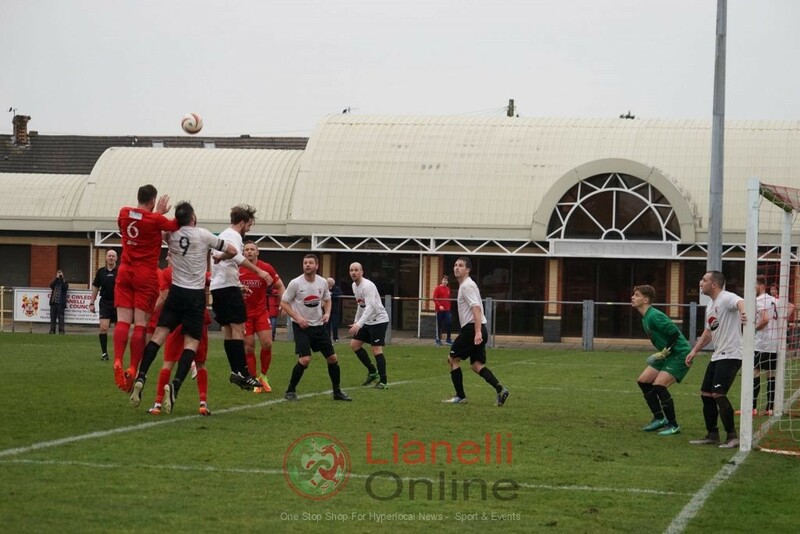 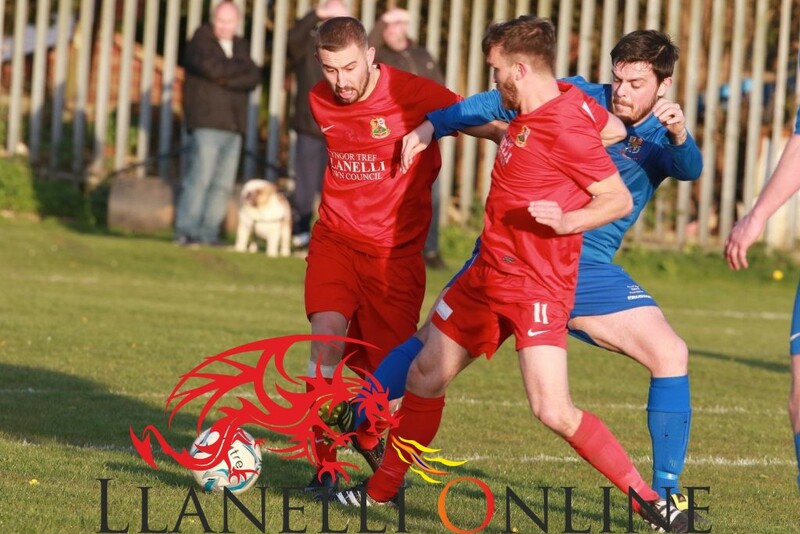 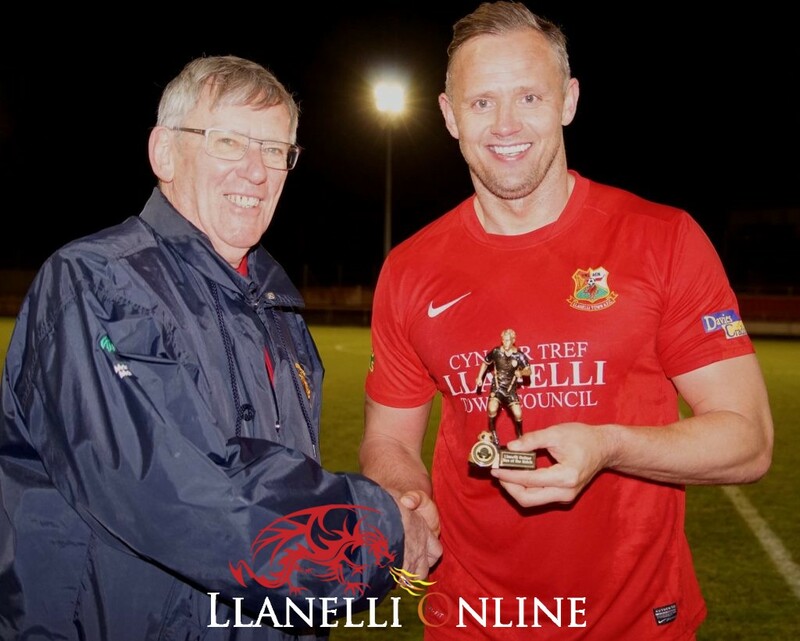 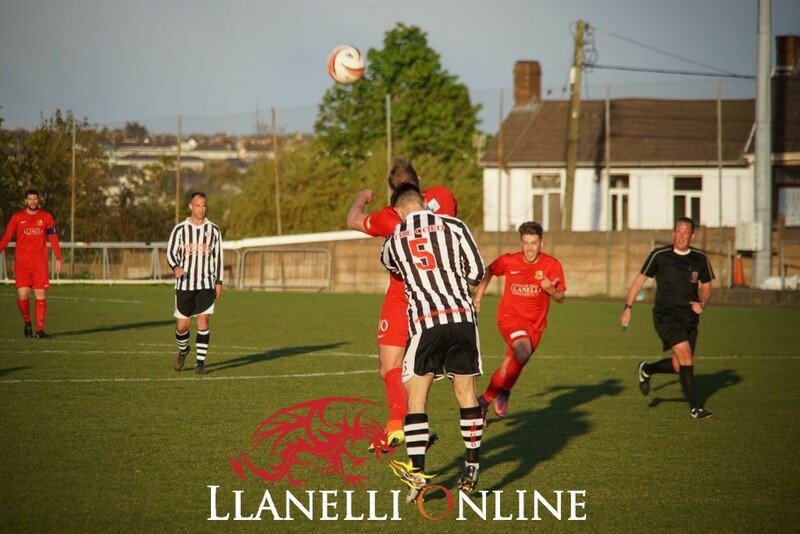 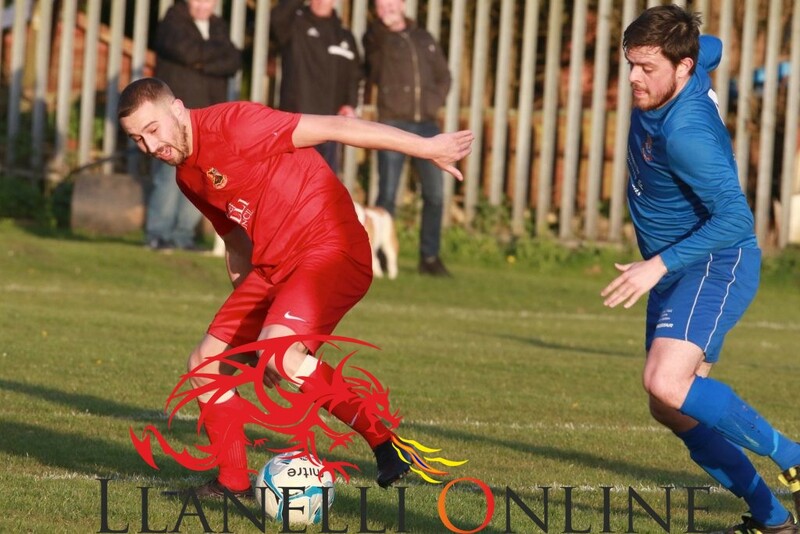 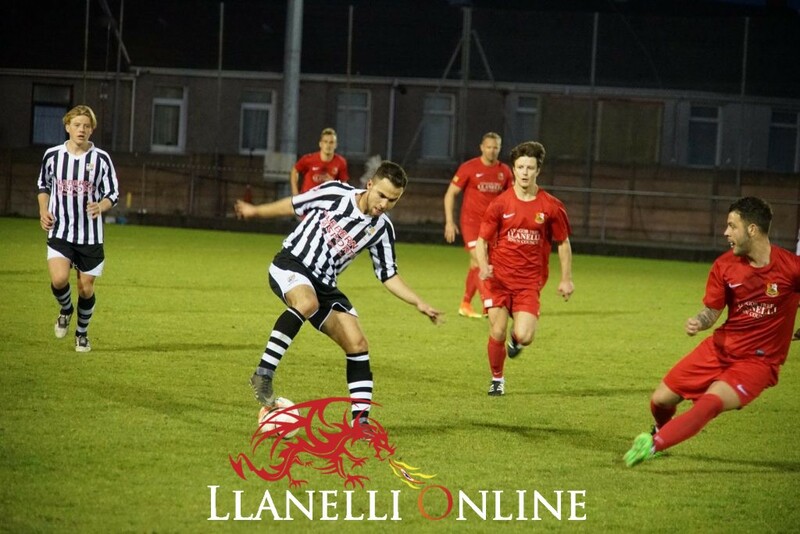 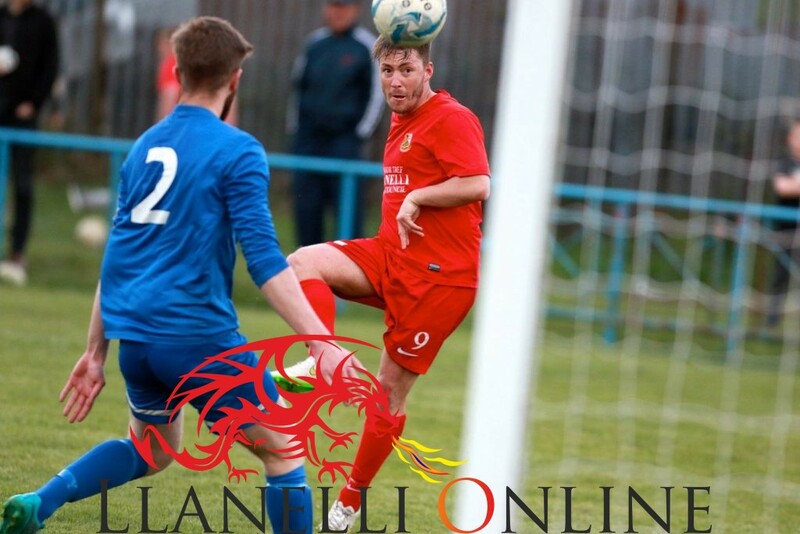 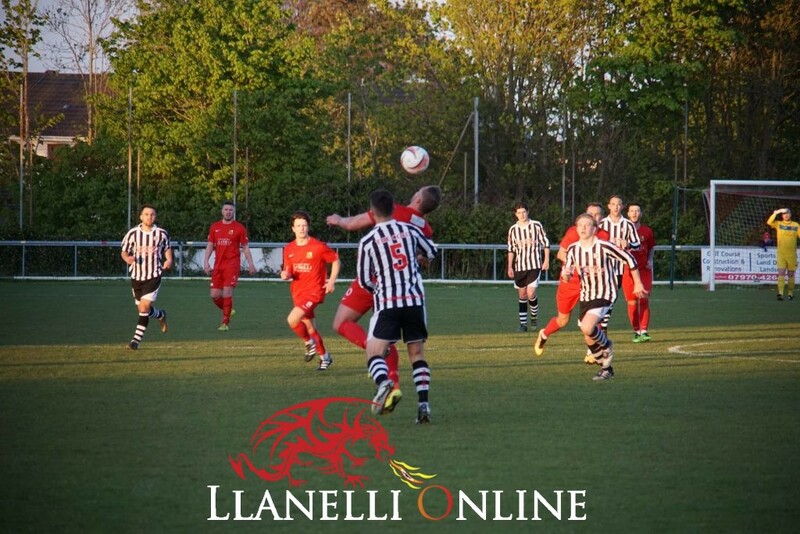 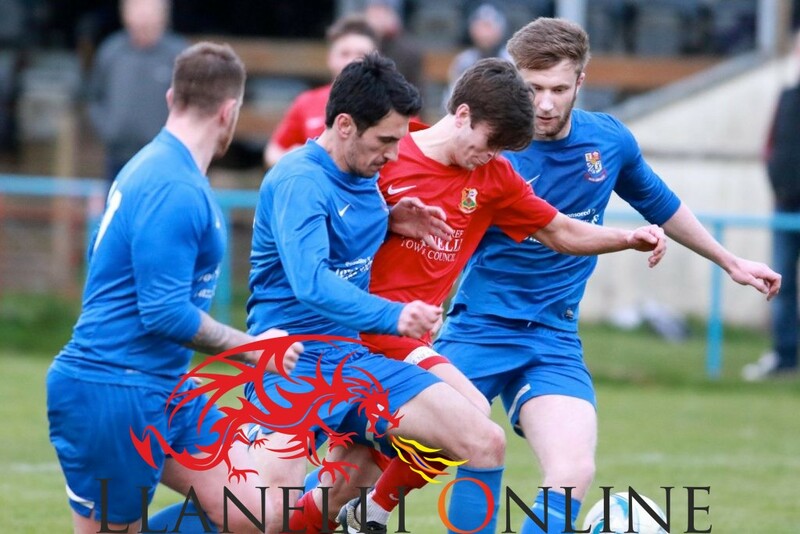 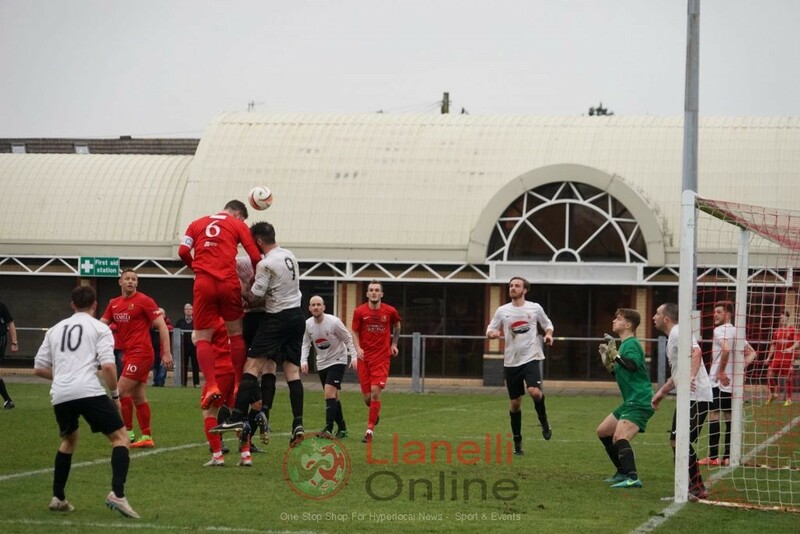 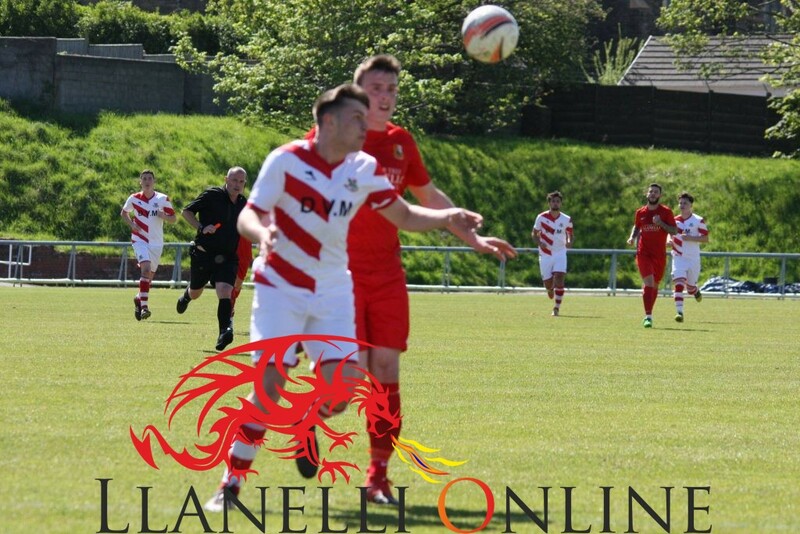 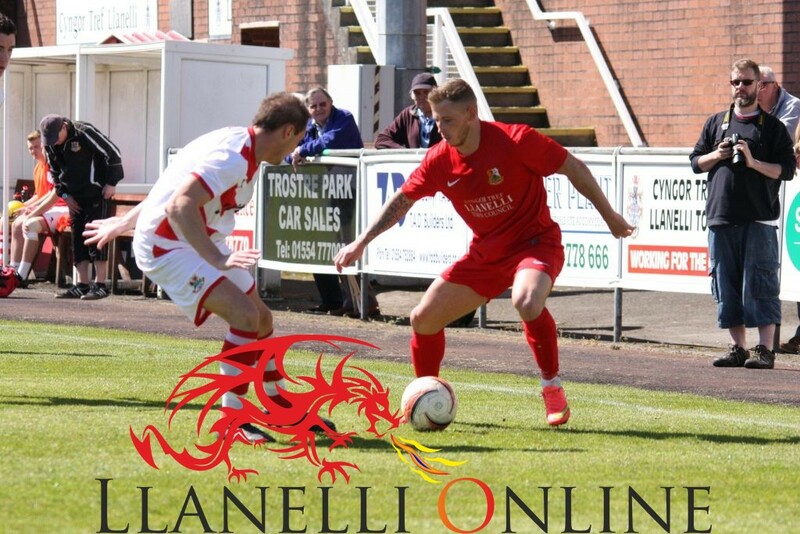 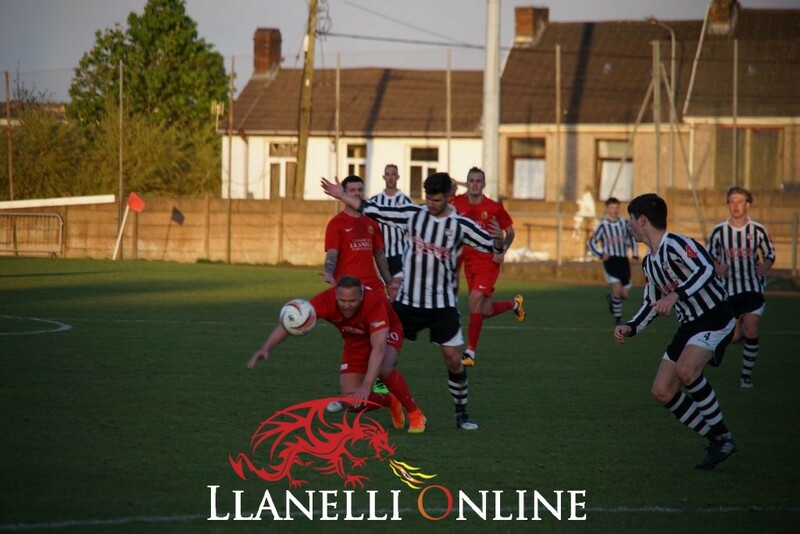 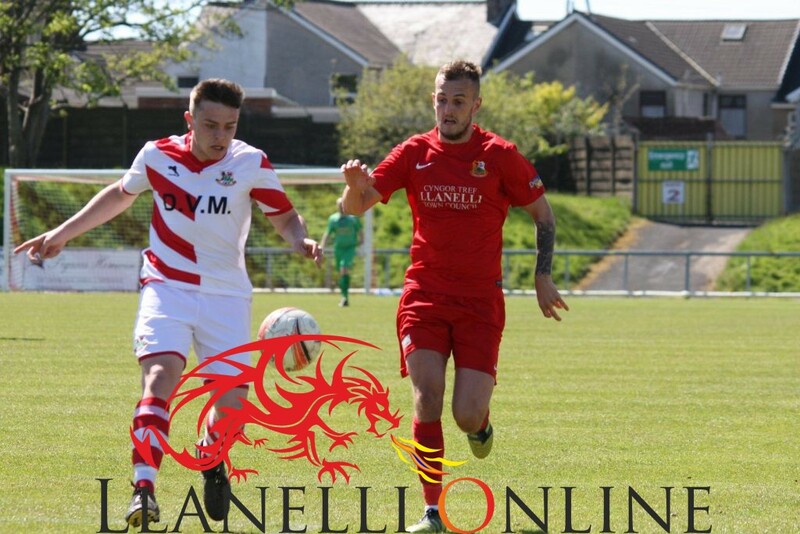 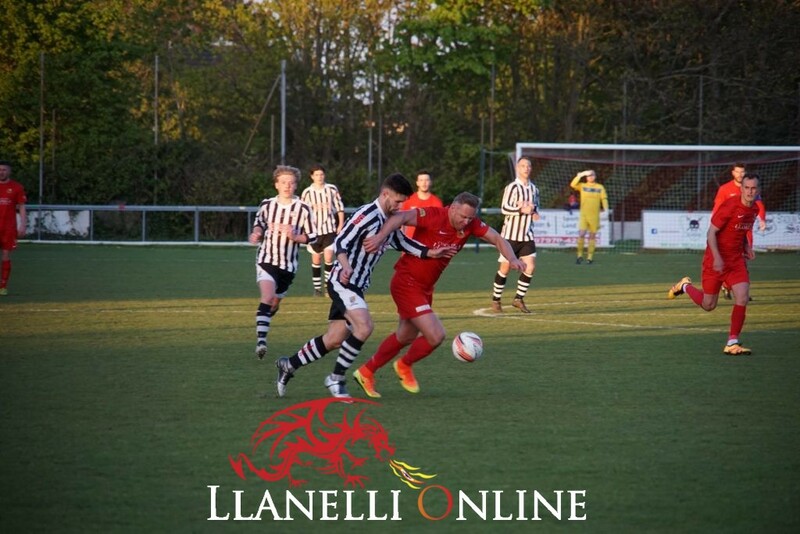 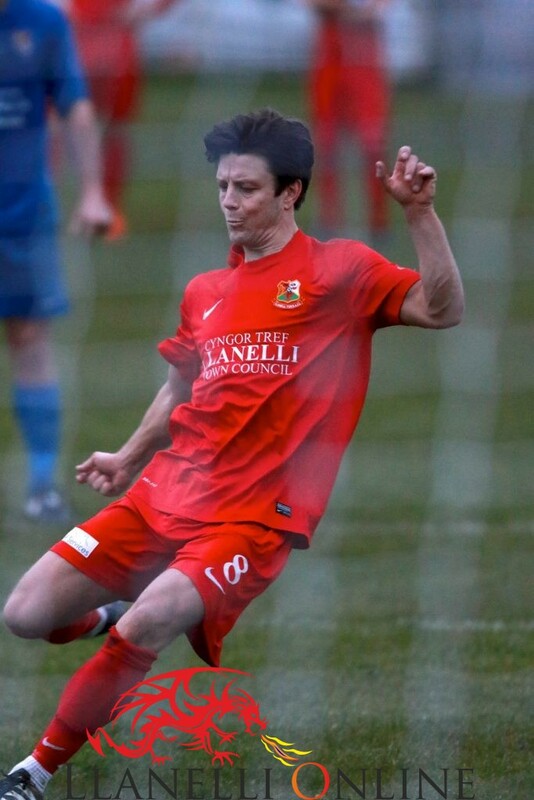 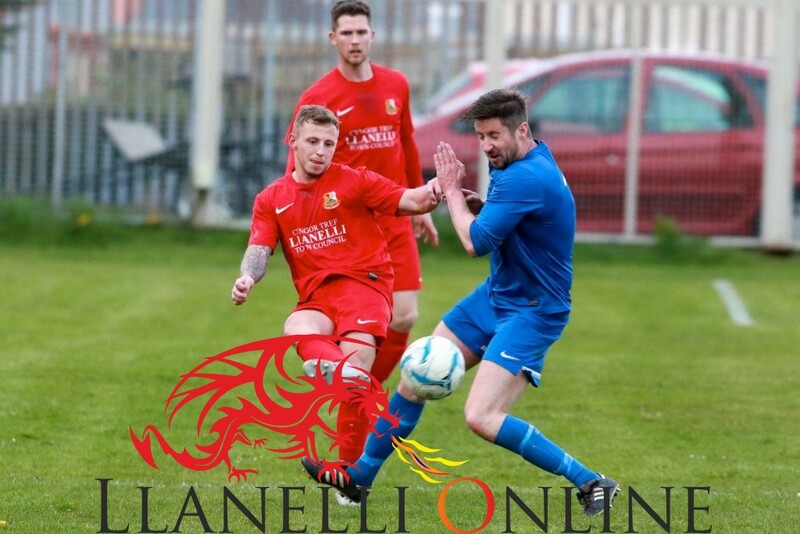 A second half Lee Trundle hat-trick, his eighth of the season, saw the Reds clinch the second division Welsh League title, but again it was a disjointed overall performance against mid-table opponents, much in the manner of the previous game versus Aberbargoed Buds. 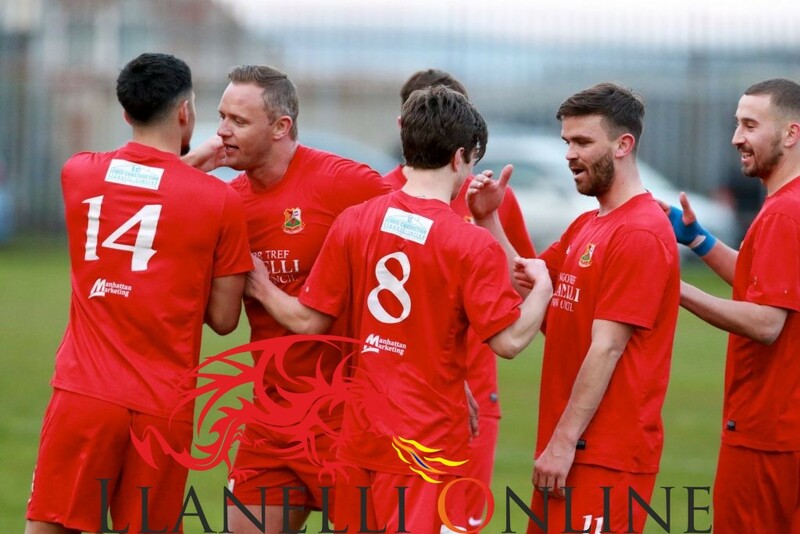 Nothing can take away, however, the elation following the final whistle as the whole squad has worked exceedingly hard throughout a long season, and fully deserves the plaudits. 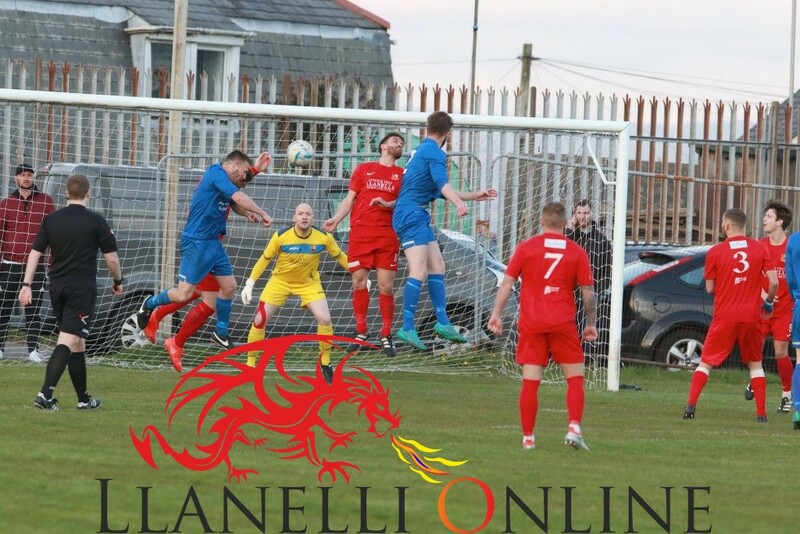 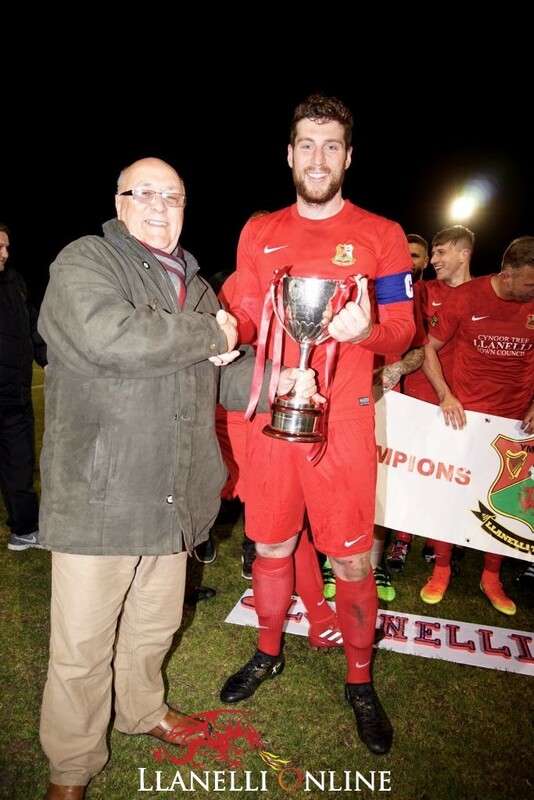 A few goals are left to achieve before the end of the season – to remain unbeaten in the league campaign; notch up a hundred goals (93 at present); and capture the league cup next month to make it a memorable double, although opponents Bridgend Street might have other ideas. 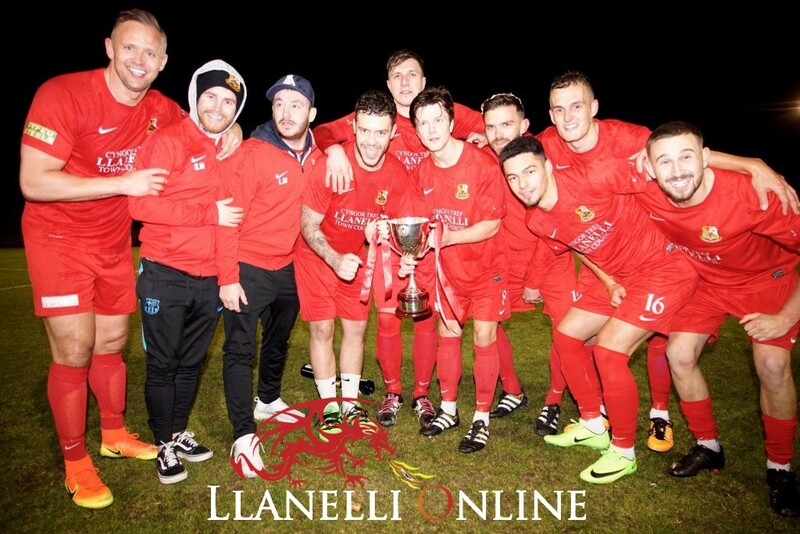 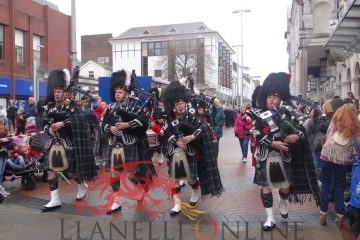 Llanelli Champions from Llanelli Online on Vimeo. 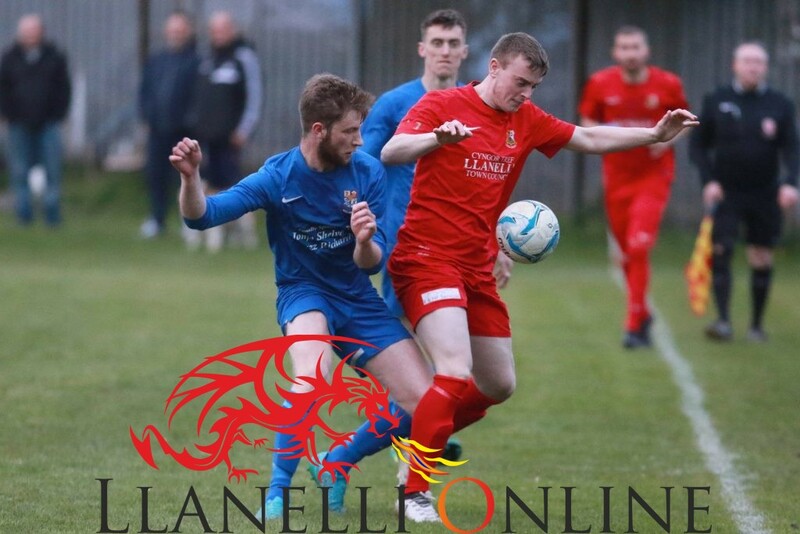 Once again, the home side dominated possession but lacked the killer punch in the final third, the best chance falling early on to Jordan Follows who failed to convert from point blank range when set up by Trundle. 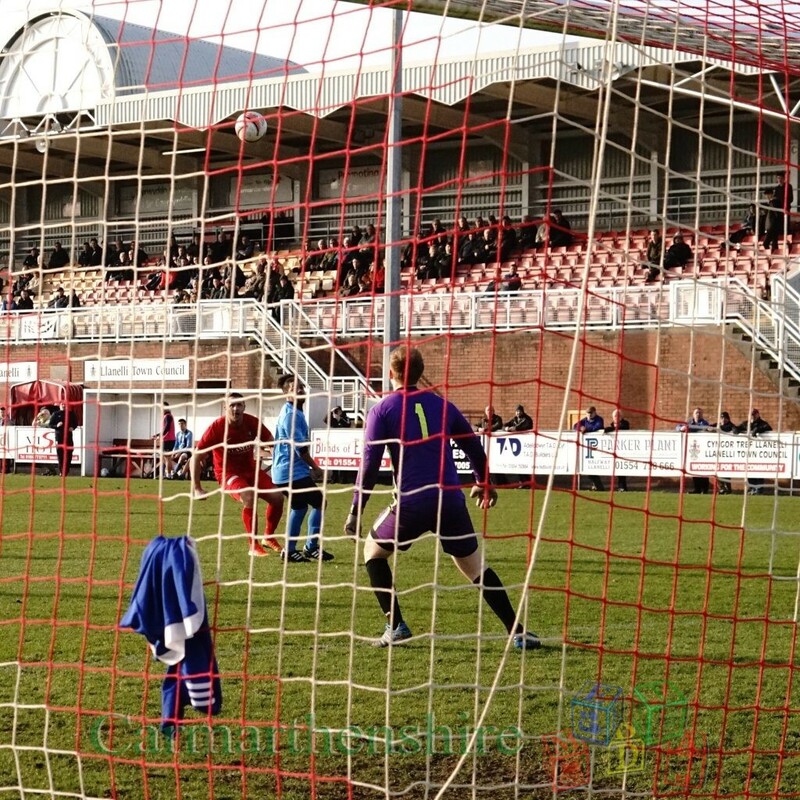 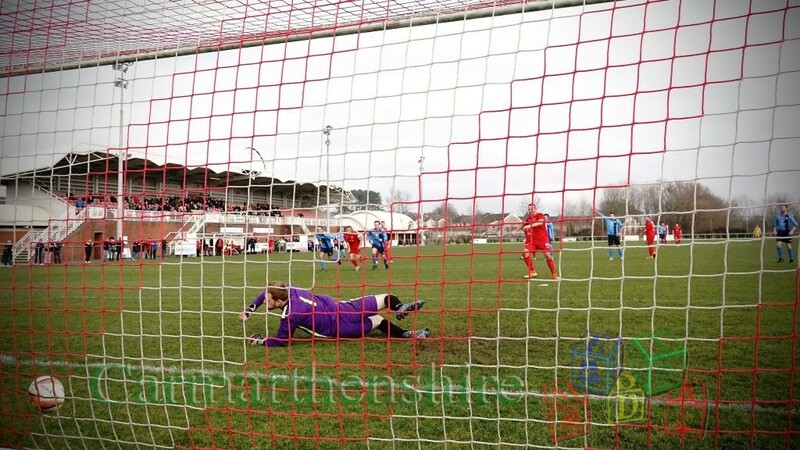 Kurtis March directed an effort to the far post which was fingertipped behind by Llwydcoed goalkeeper, Andrew Hargreaves, and when Jordan Davies met a Trundle assist, he fired just over. 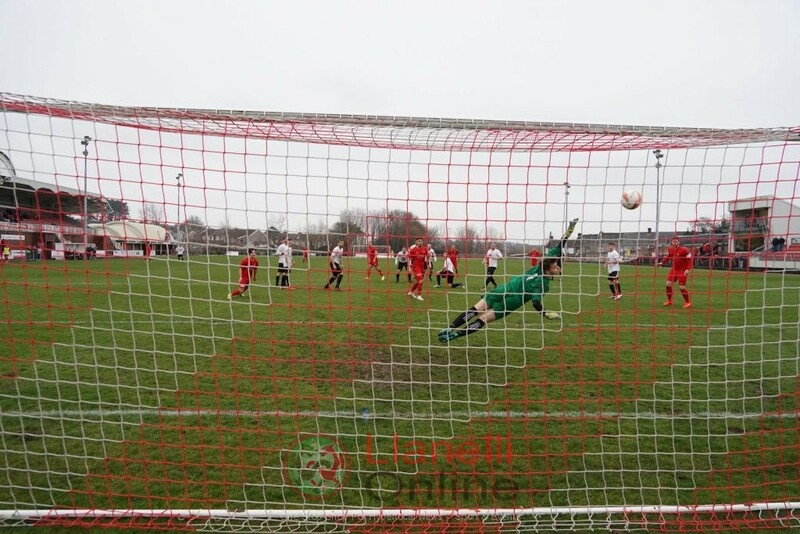 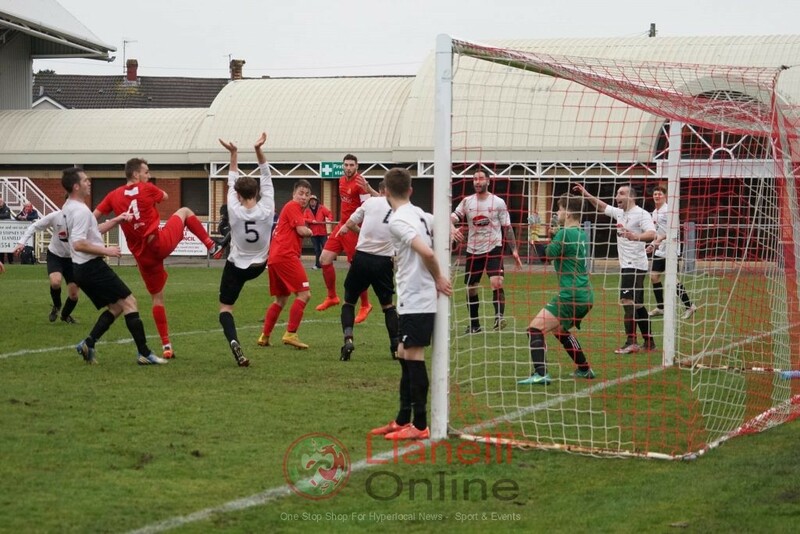 When the visitors countered, Ricky Carter was sent clear down the left by a ball from Liam Pride, and with Craig Morris electing to come off his line in an attempt to close him down, Carter sent his effort towards the vacant goal, and it took a clearance by March to keep it out. 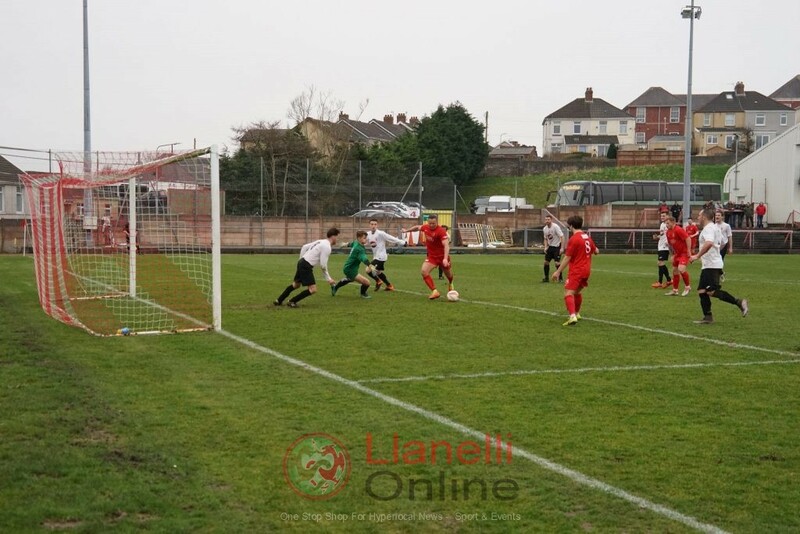 Chris Thomas halted Pride from making ground in the box with a nicely judged tackle, before Davies was unlucky when his well struck free kick rebounded off the inside of the near post and down on the line before being hacked away. 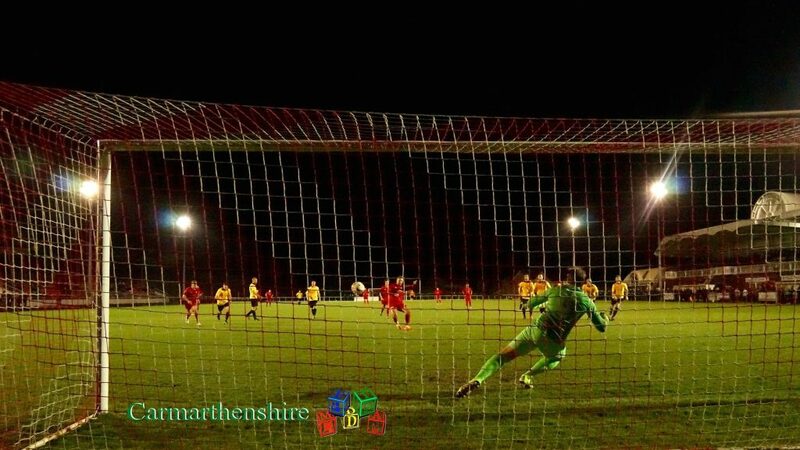 With the contest all square at the break, a similar pattern emerged in the second half with the Reds dominant but unable to break down a stubborn visiting defence. 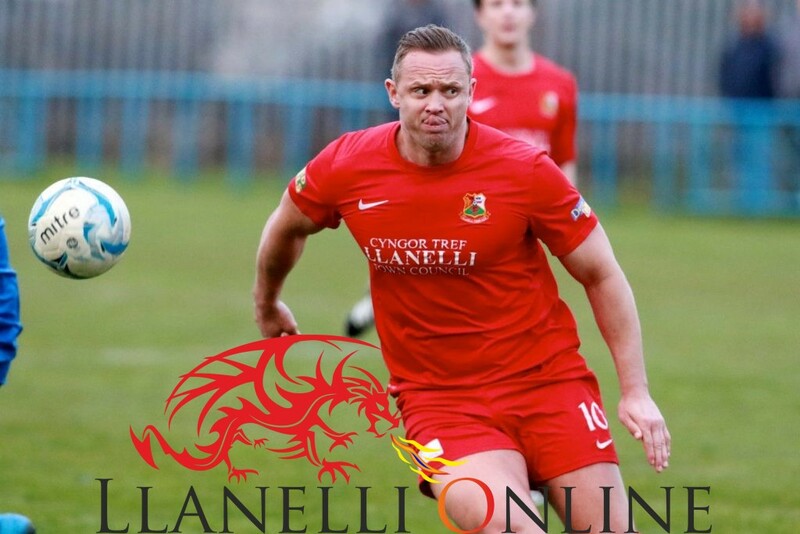 But cometh the hour, cometh the man, and Trundle, who had been kept reasonably quiet by being well marshalled, was found by Follows on the edge of the box, and with a trademark swivel, rifled his finish into the bottom corner on 62 minutes. 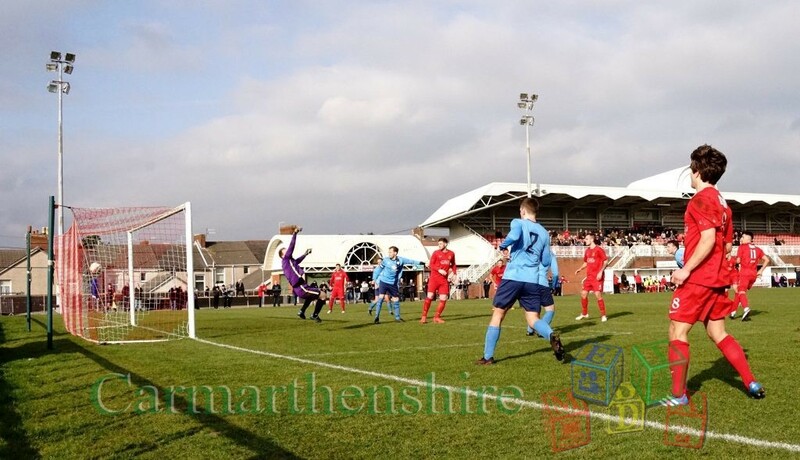 This did wonders for the Reds` morale, and they upped the tempo with Joe Clarke having his shot on target pushed clear by Hargreaves, before the home side made a couple of changes with Follows and Liam Samuel being replaced by Richard Lewis and James Loveridge after 74 minutes. 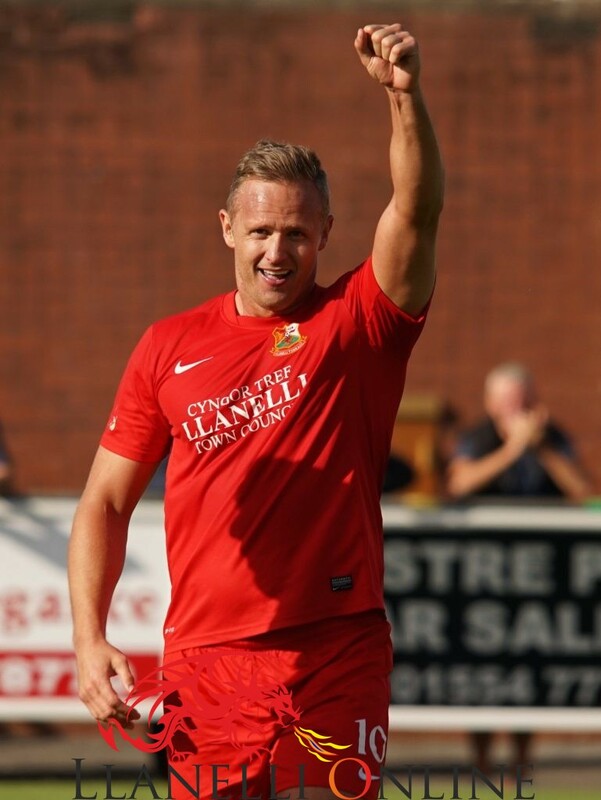 Not long after, the lead was trebled in the space of two minutes after 78 and 80 minutes, with Trundle completing his hat-trick with carbon copy finishes both into the bottom corner past the helpless keeper, while sandwiched between these, Robert Thomas became the Reds` latest centurion when he replaced Anthony Finselbach on 79 minutes. 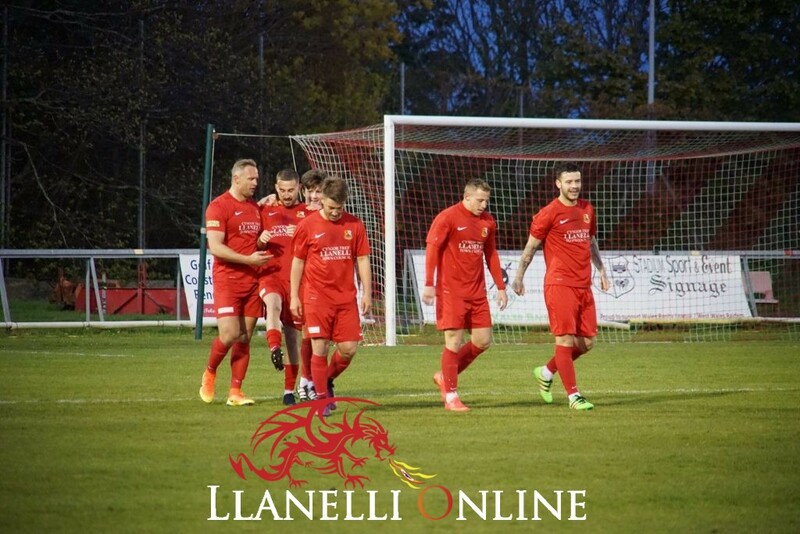 A successful ending to a home campaign in front of their supporters by the Reds, and with the pressure off them, can now hopefully go on to win their remaining three matches and preserve an unbeaten record. 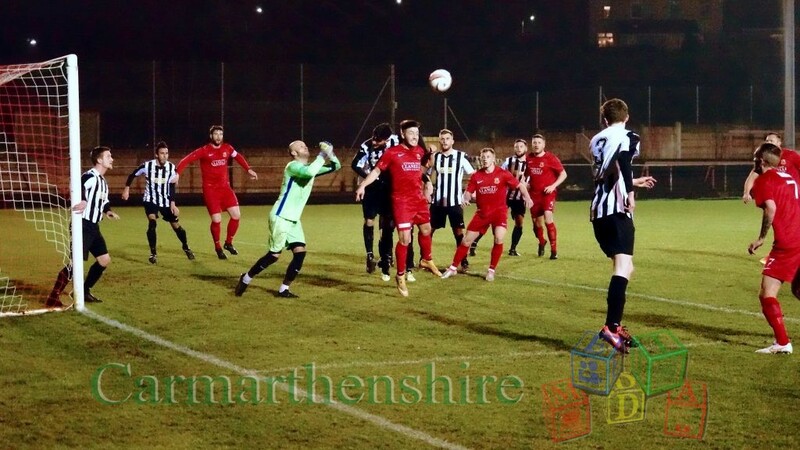 LLWYDCOED; Hargreaves; L. Williams (Hawkins, 85); Jones; G. Williams; Butler; Roberts (Henry, 65); Jenkins; Andrews (Ellis, 53); Carter; Pride; Evans; Subs. 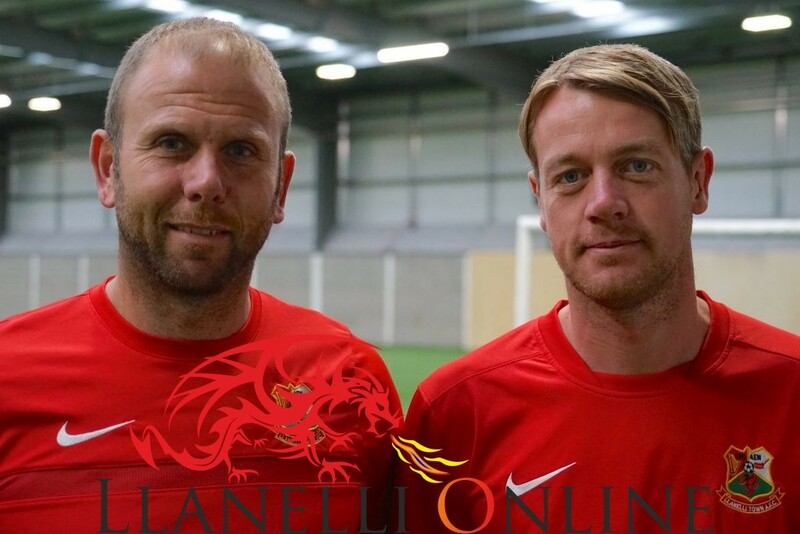 not used; Stanlake; Friel. 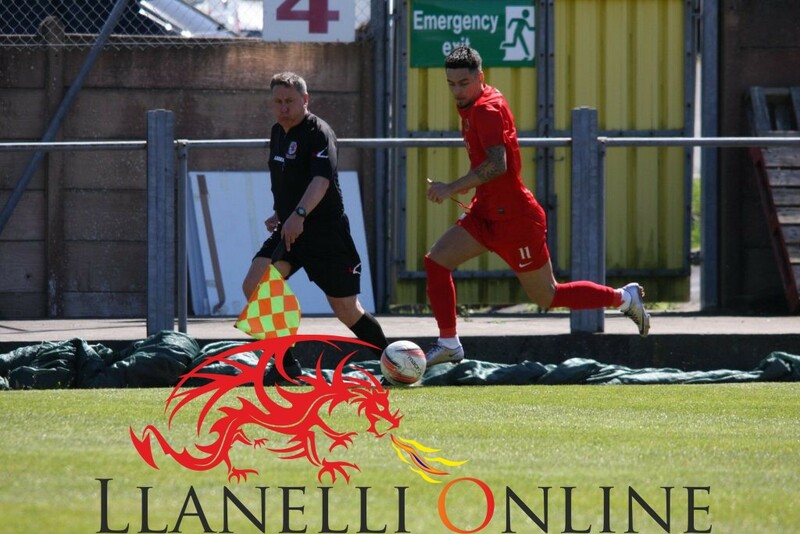 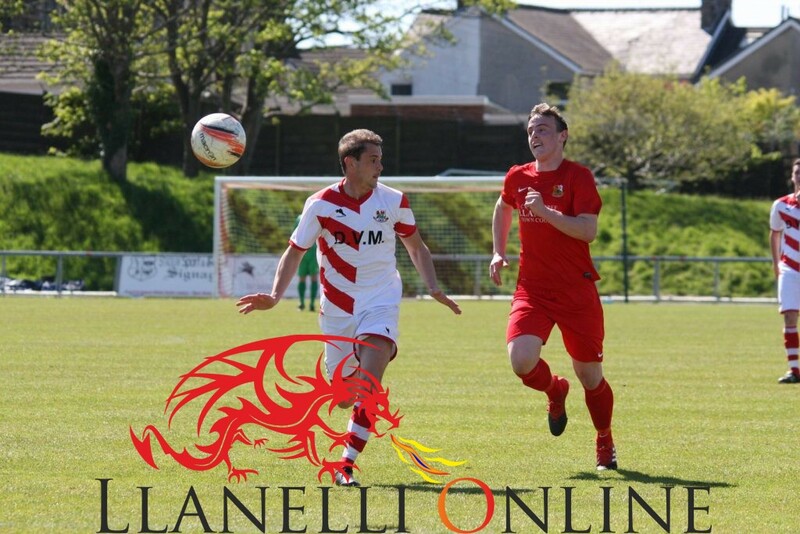 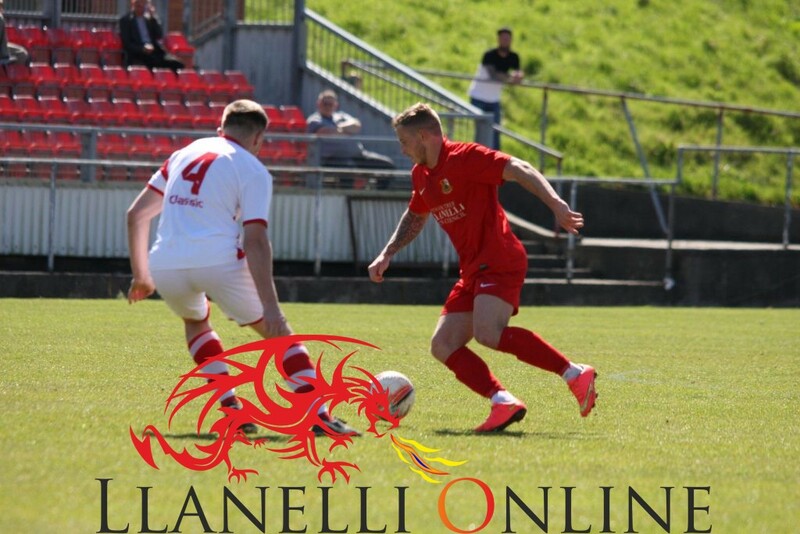 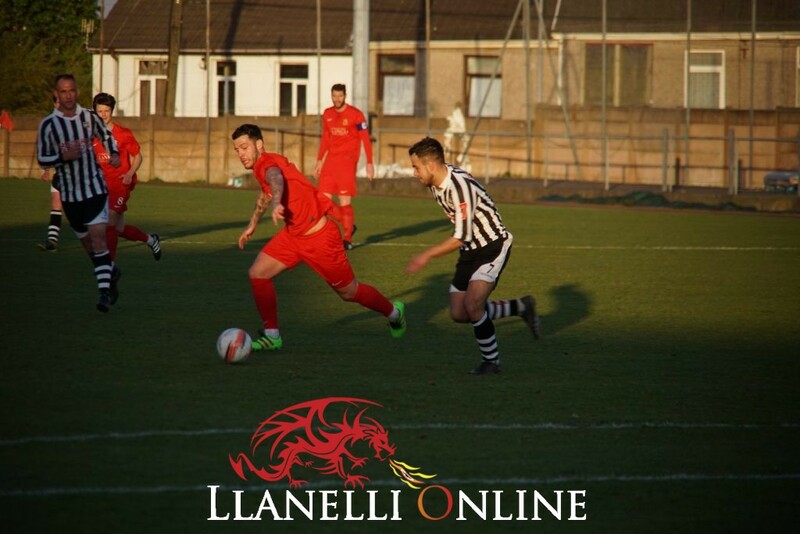 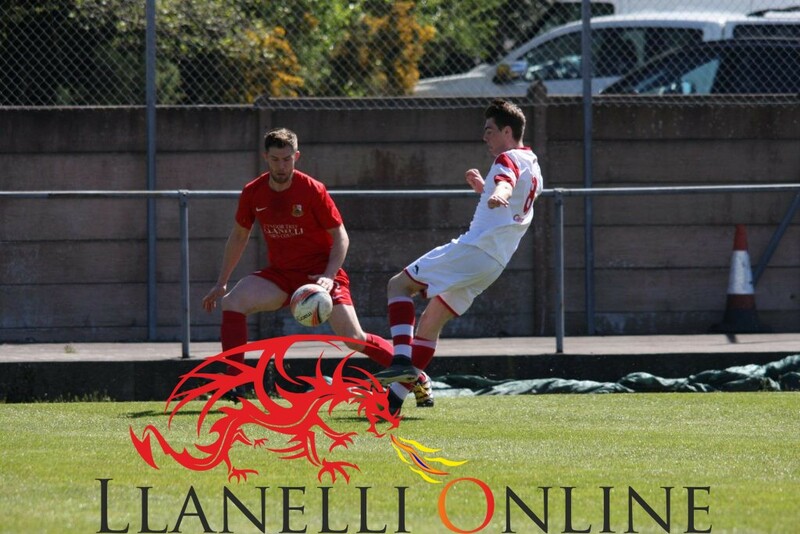 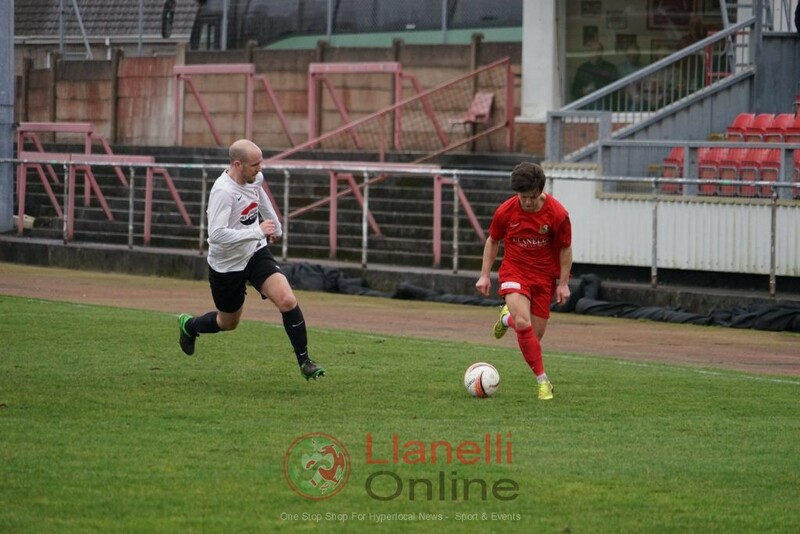 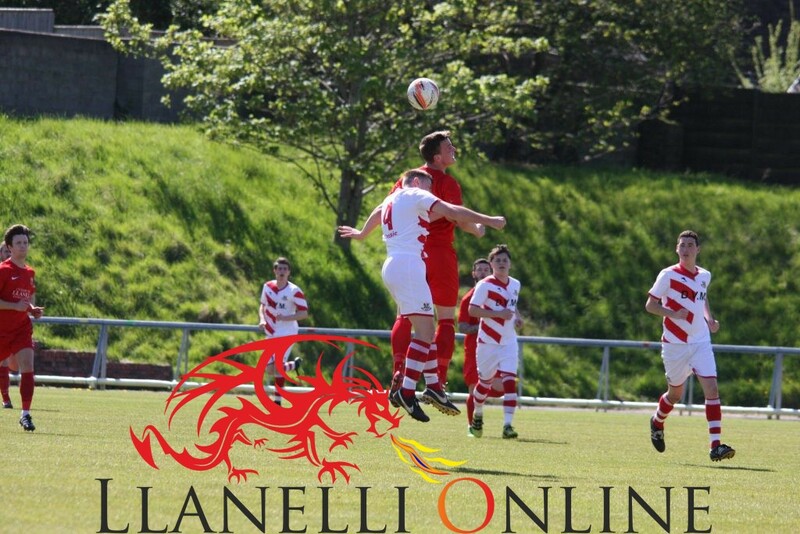 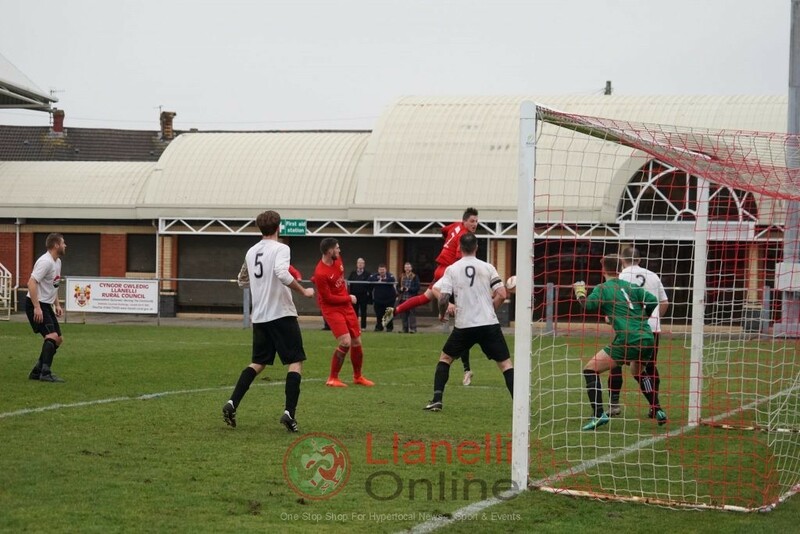 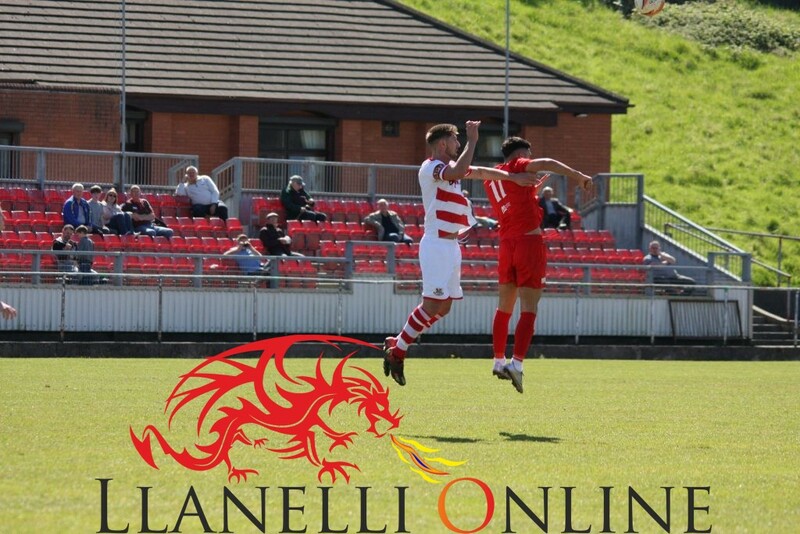 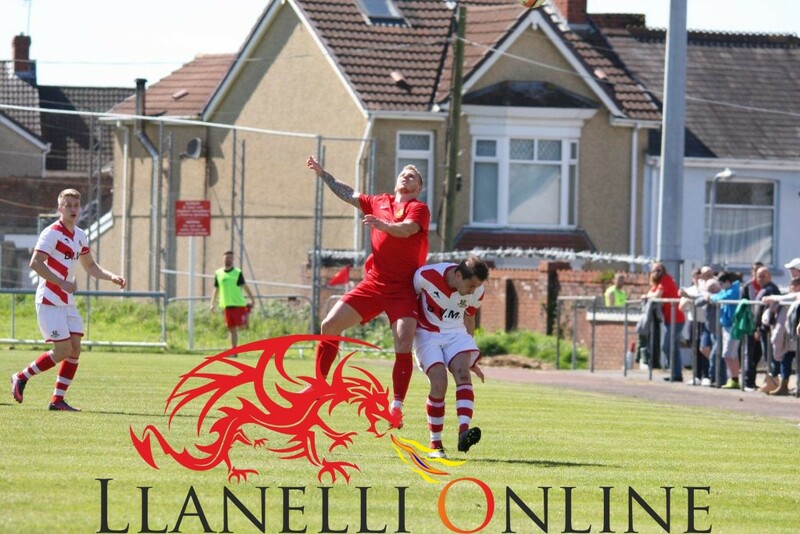 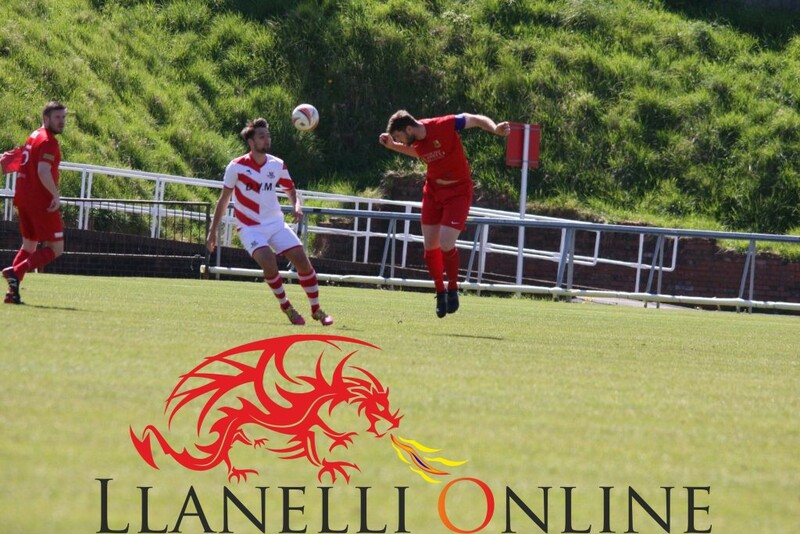 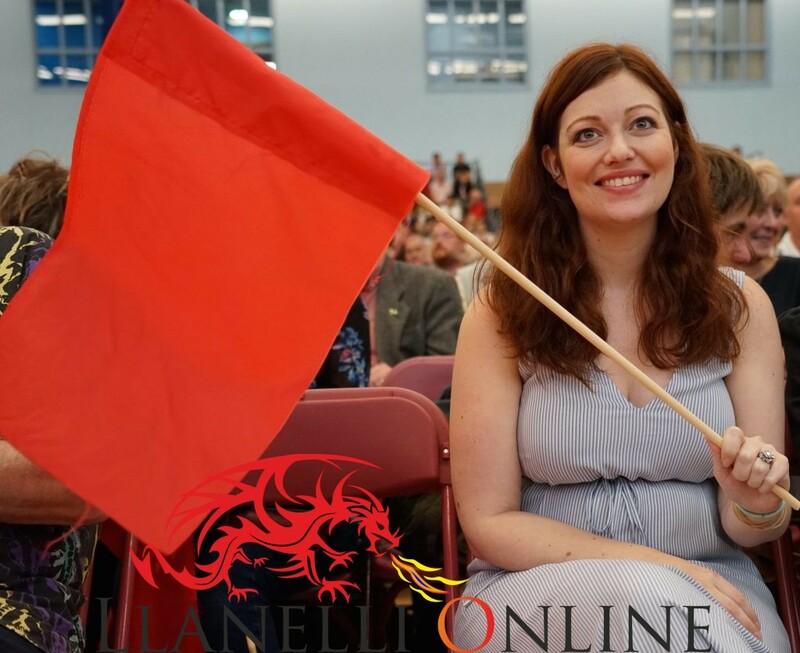 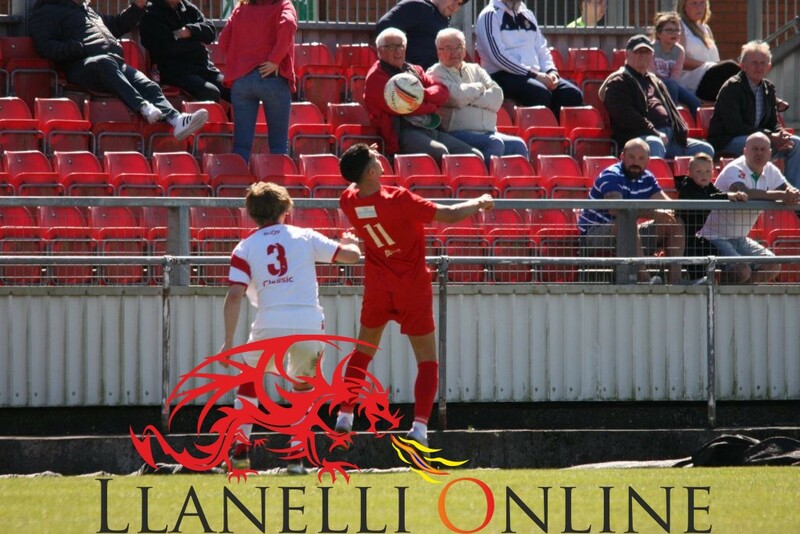 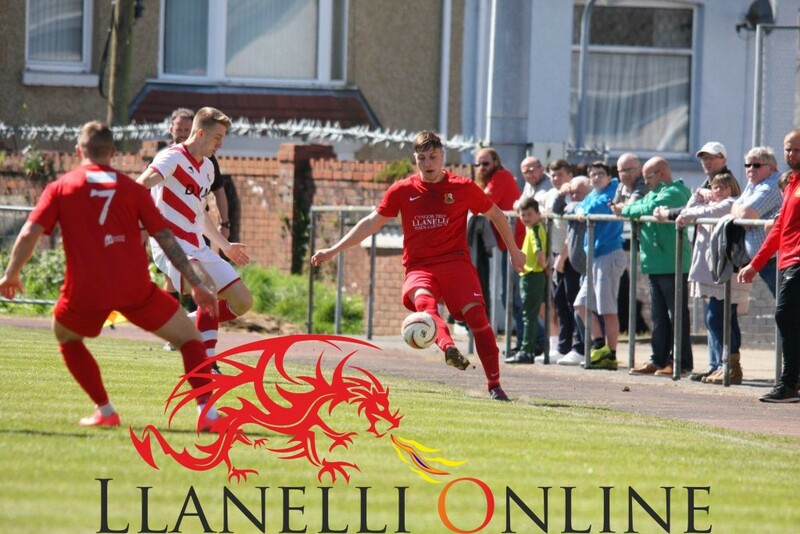 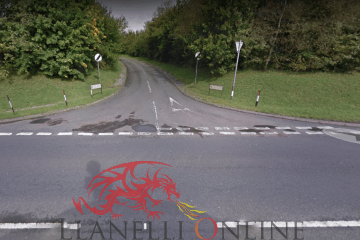 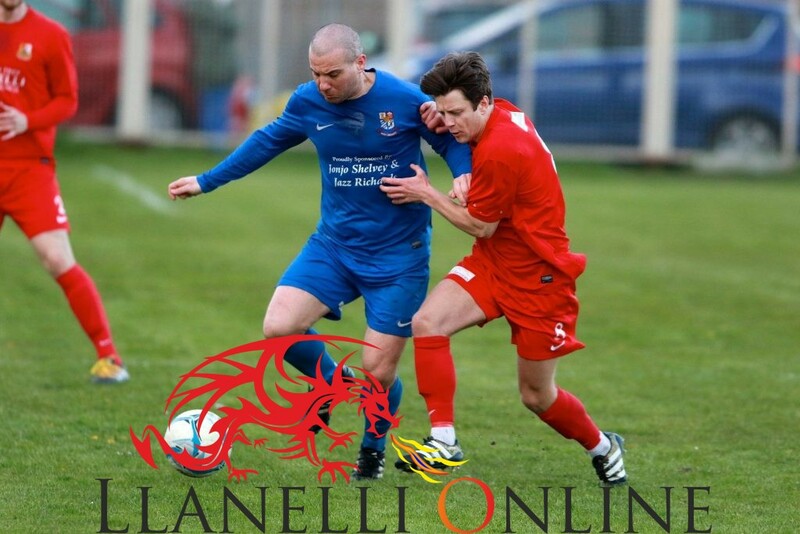 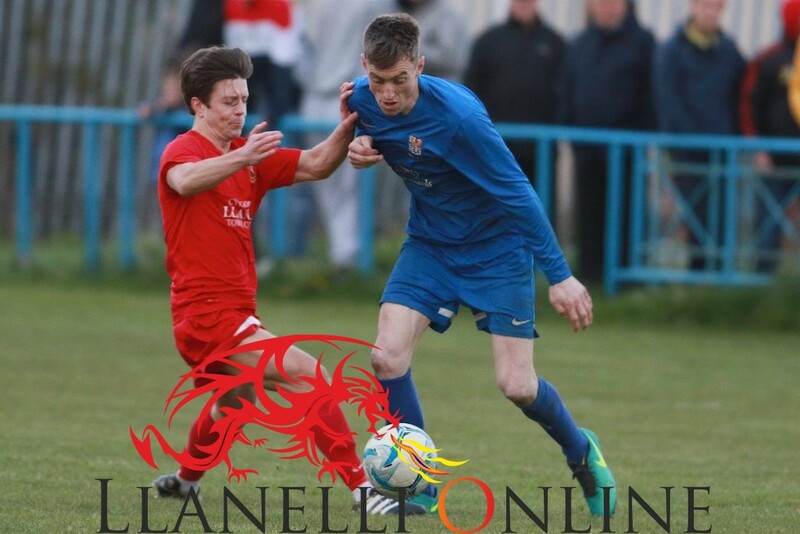 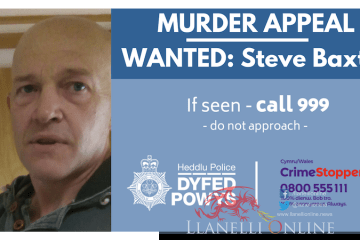 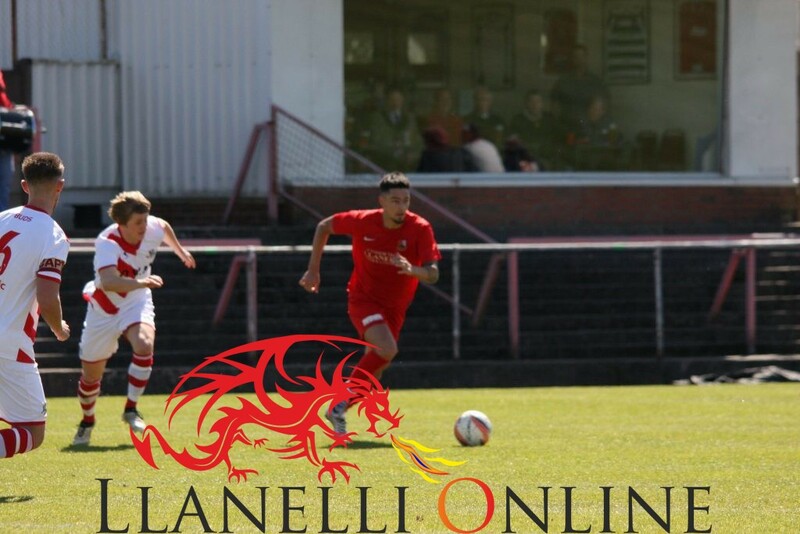 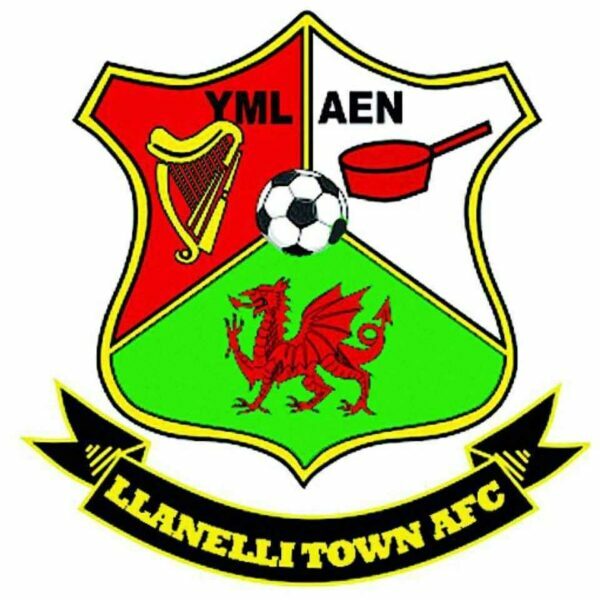 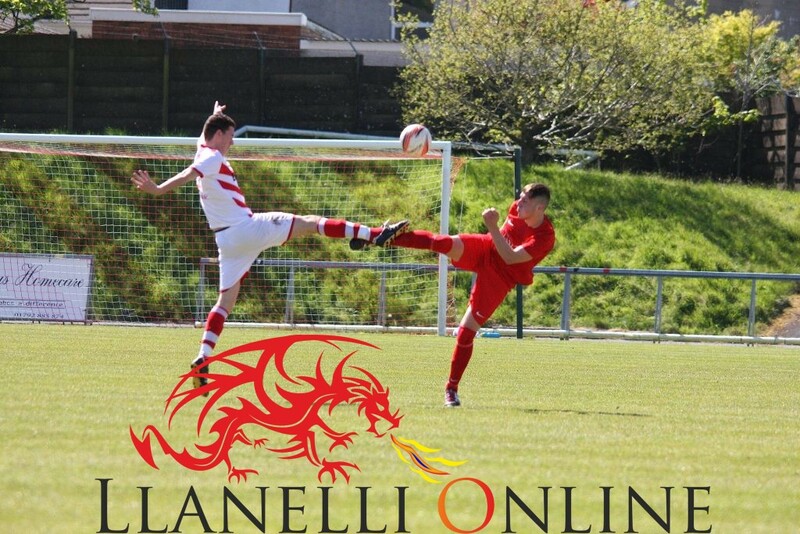 SCORER; Llanelli Town – Trundle, 62, 78, 80. 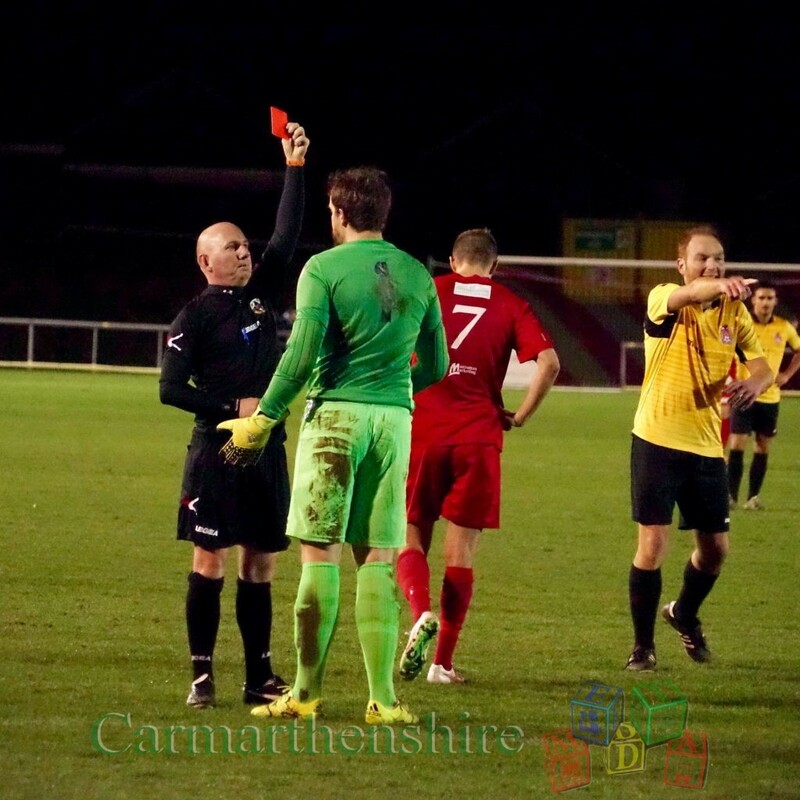 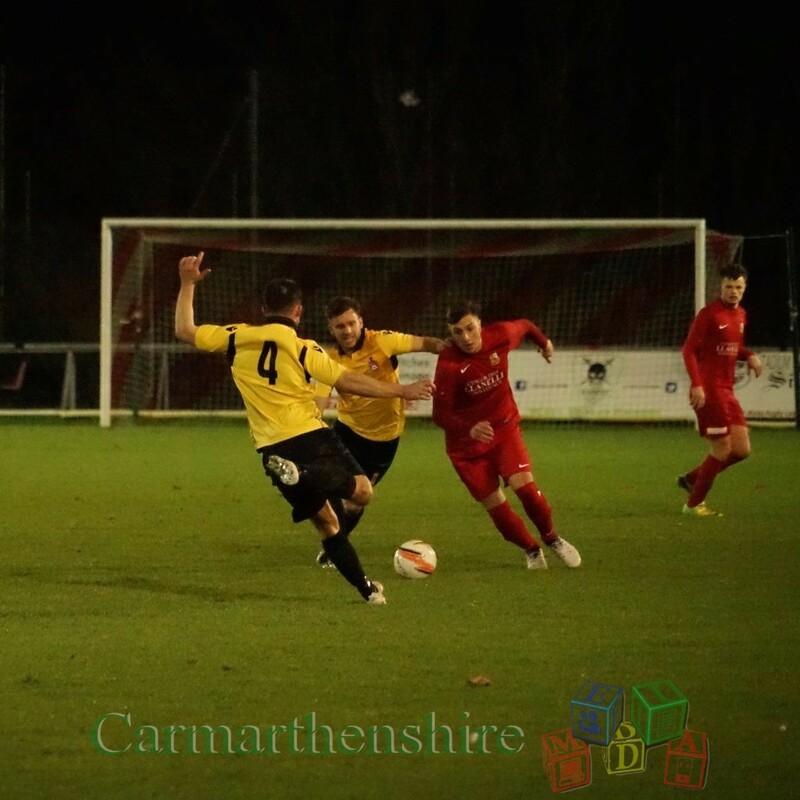 YELLOW CARDS; AFC Llwydcoed – G. Williams; Evans. 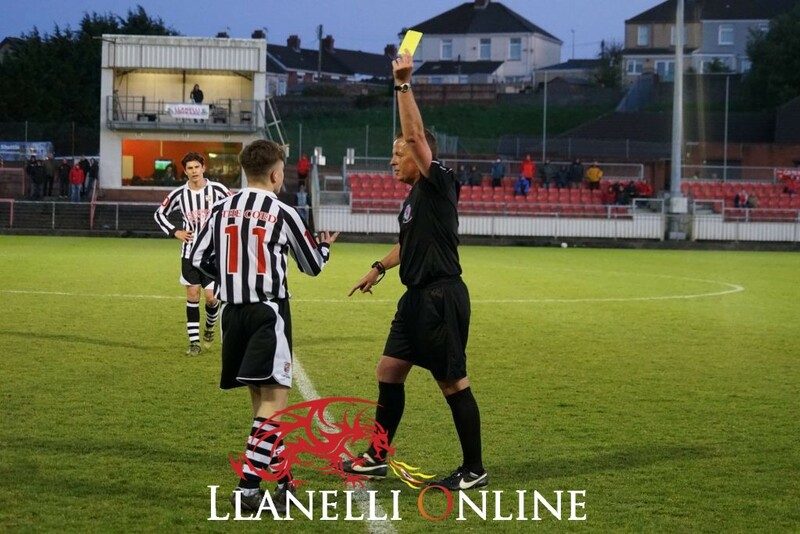 REFEREE; Paul Fisher (Port Talbot). 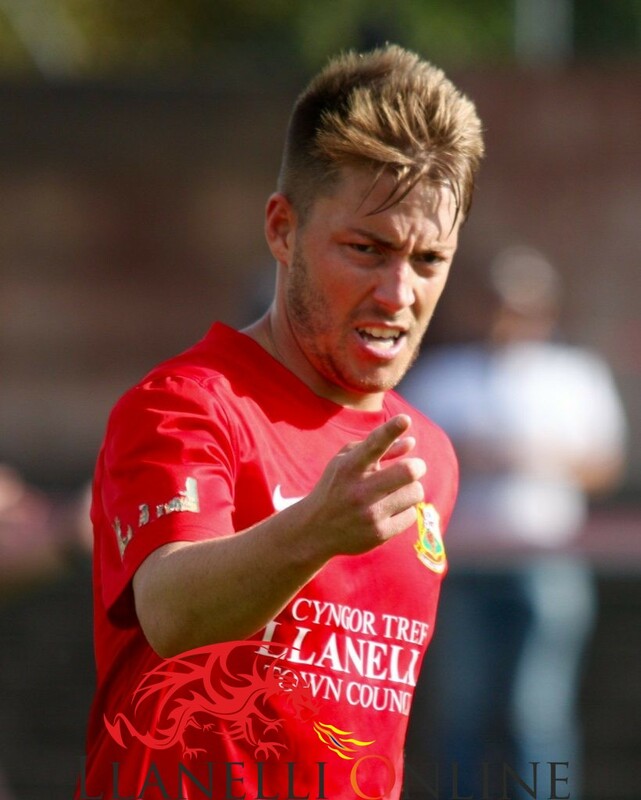 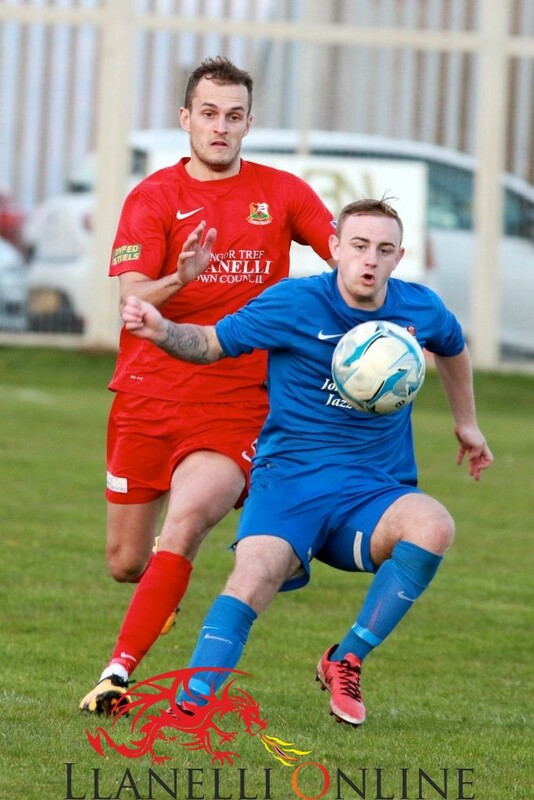 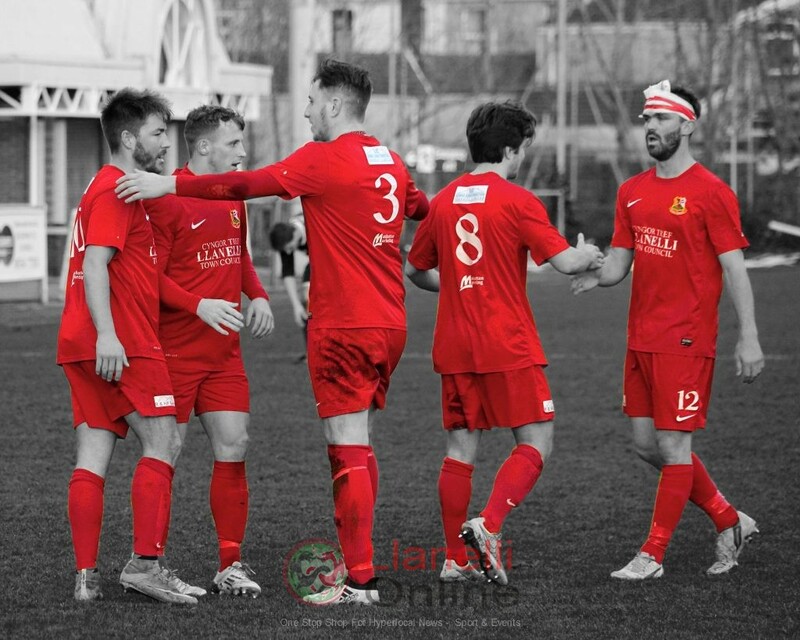 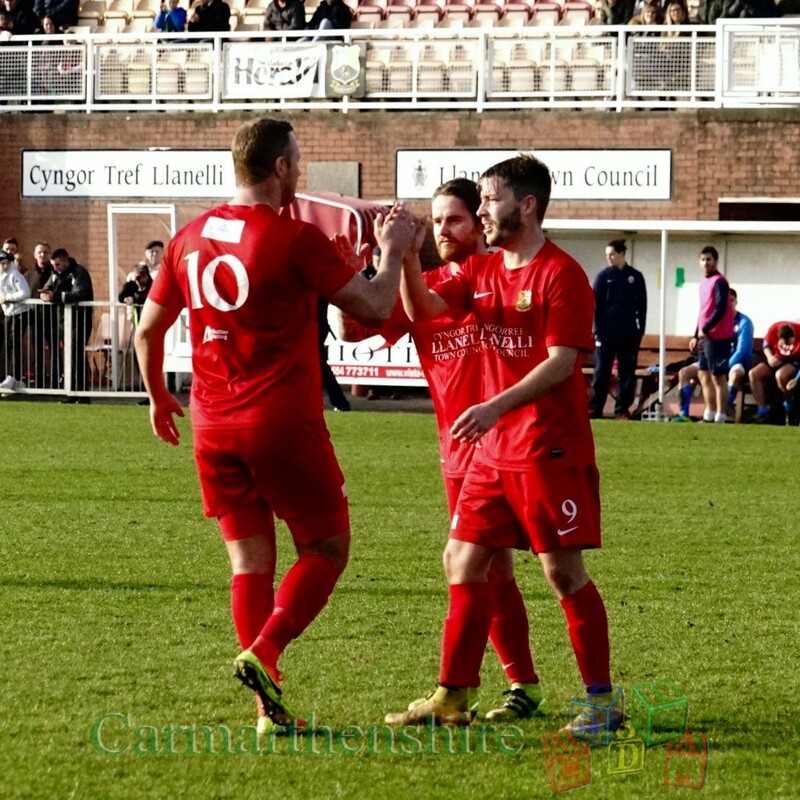 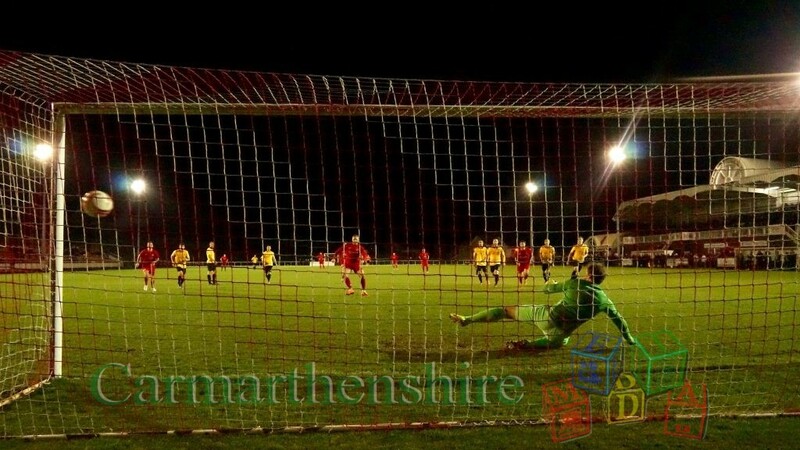 The Reds play their remaining two away matches at Abergavenny Town on Friday, 5th May, kick off 7.30 p.m., and round off the season at near neighbours Ammanford on Monday, 8th May, kick off 6.30 p.m.